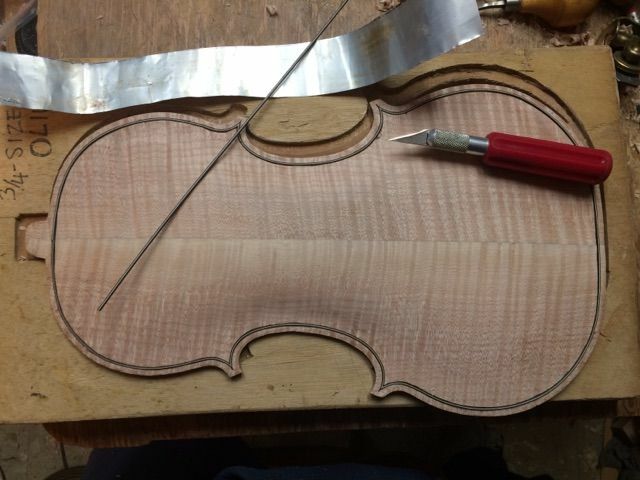 It is a lot easier to purfle the front plate before the neck is installed. 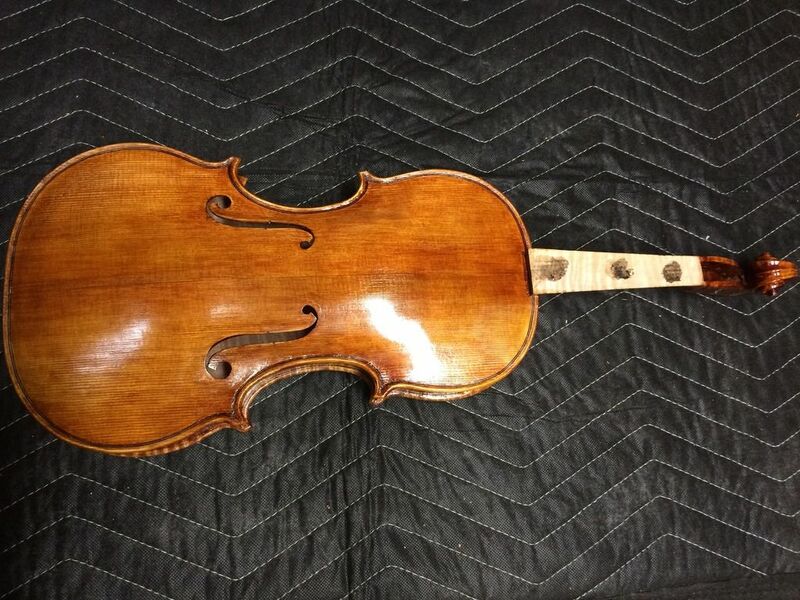 But I have found that I can get better results purfling after installing the plates, than before, though I was taught to purfle the plates very early, before even completing the arching. 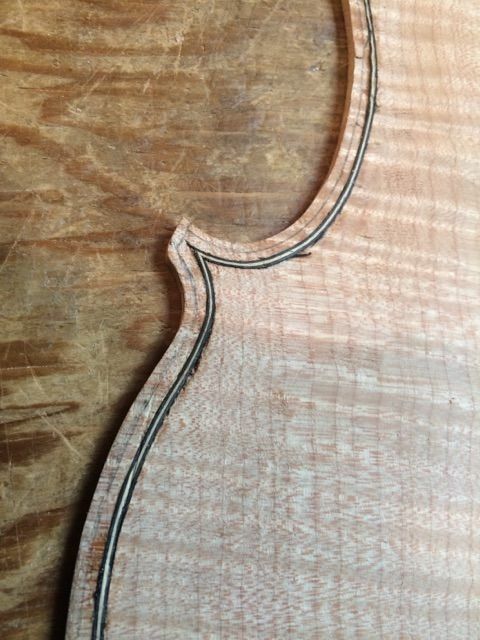 But what consistently resulted was that I could not reliably produce even-looking edge-overhangs when I purfled before plate installation. 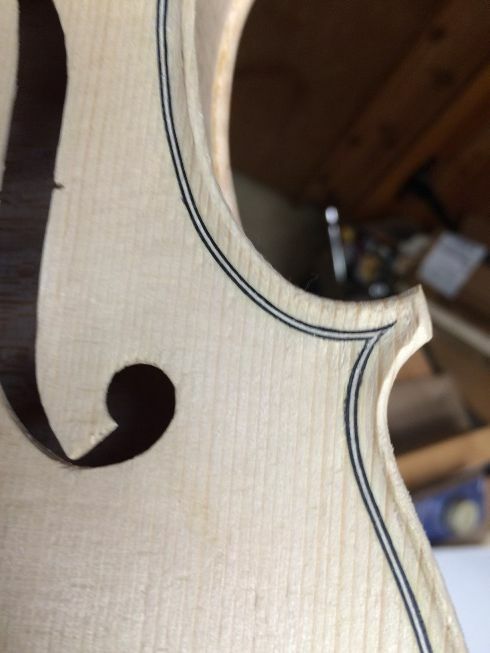 I have scribed in the lines, using a purfling-marker, and am beginning to incise them. 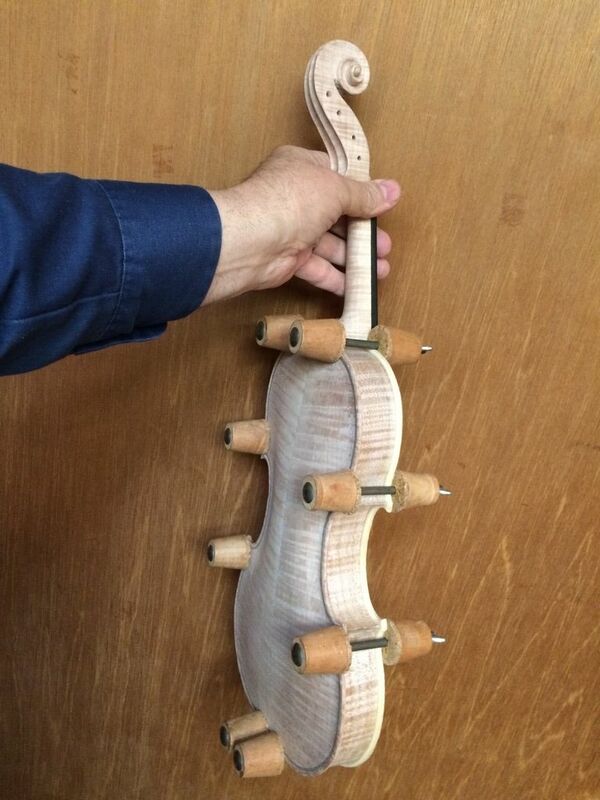 The slot is beginning to develop. 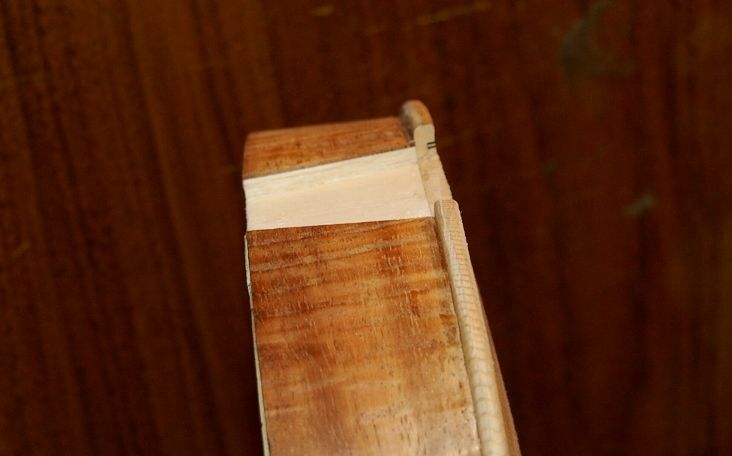 I use the piece of purfling to check the fit of the slot. 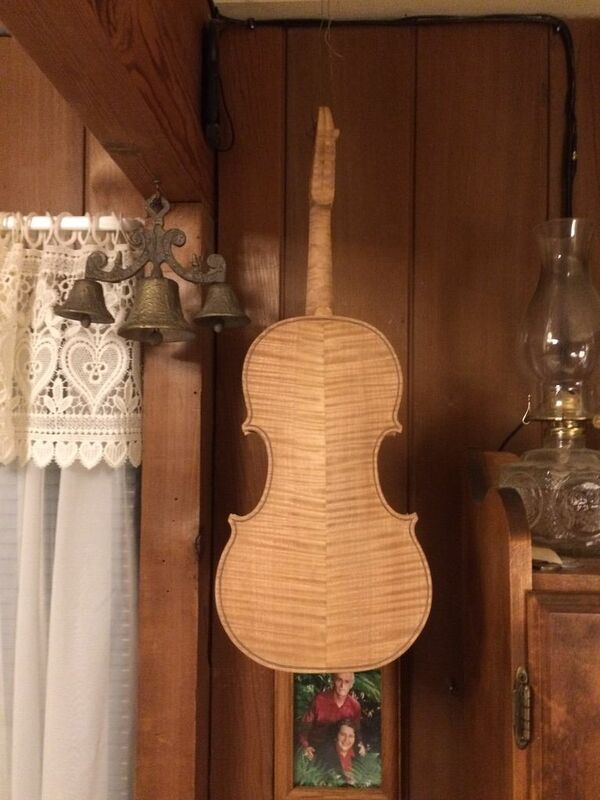 The purfling slot is complete: ready for purfling. 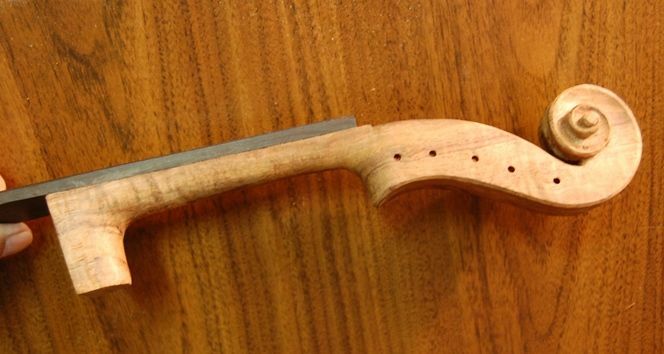 A knife, two purfling picks and the purfling marker are in view. 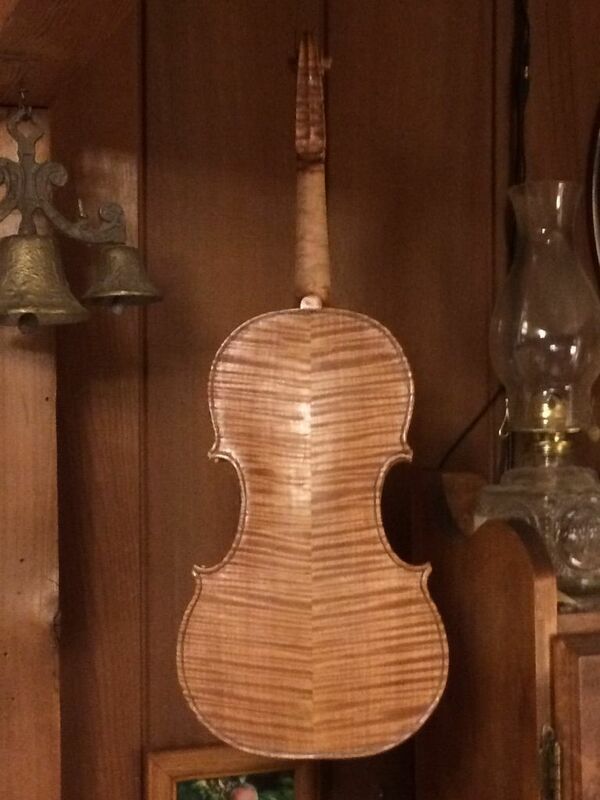 The purfling is installed, but not trimmed: the channel is next. 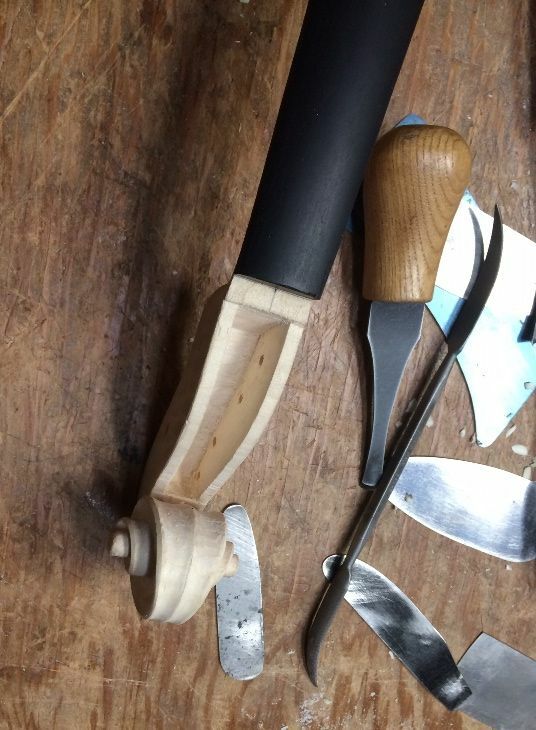 I used the roller to press the purfling deep into the slot. I did not take as many photos as would have been ideal. I was concentrating on the work, and not thinking about pictures. Sorry. 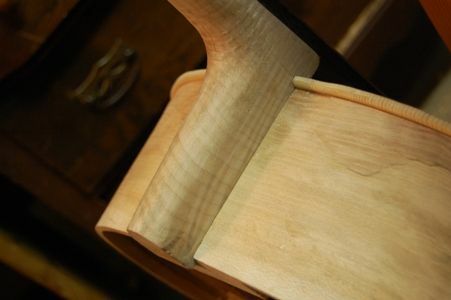 The heel-end of the neck had to be as close to exactly the final shape as possible before I laid out the neck mortise. 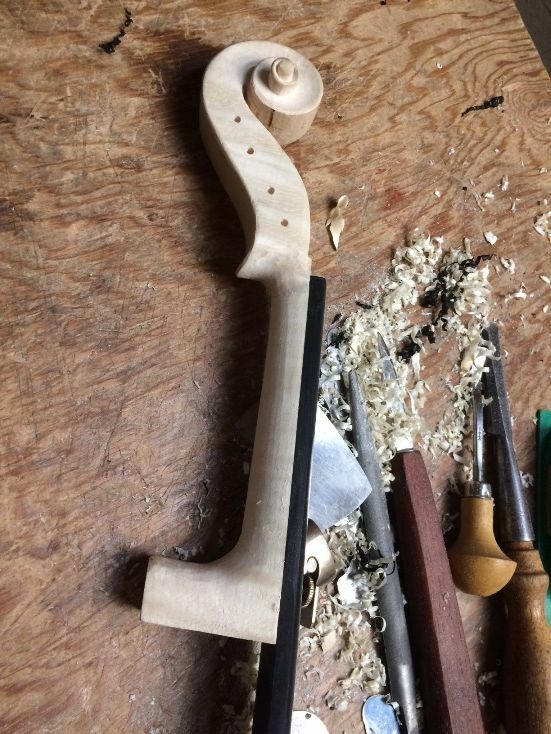 As it turned out, I had set the taper incorrectly, forgetting that I had deliberately left the heel long, so I had to re-shape the neck-heel. Fortunately, I caught it early, and was able to make the correction. 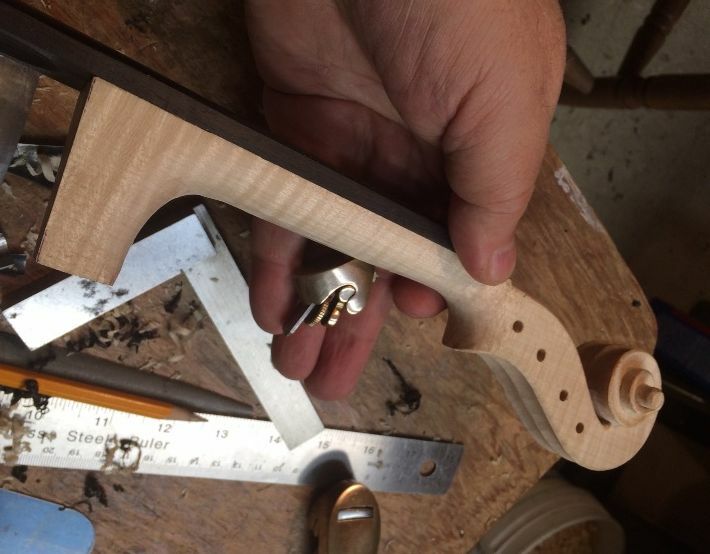 When setting the neck, I make no further changes to the neck-heel, but rather, I carefully shape the mortise to receive the neck-heel. 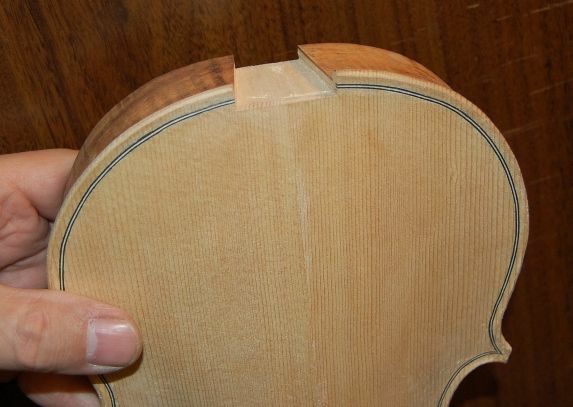 But the end result was quite satisfactory: all five were correct, and the fit was tight. 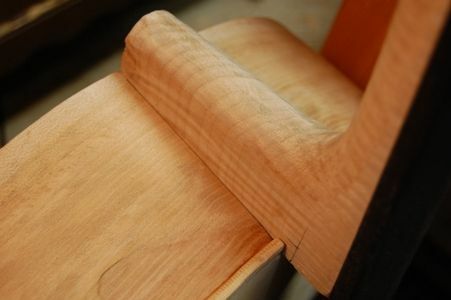 I slathered in the hot hide-glue, and rammed the neck home one last time: no clamps were needed. 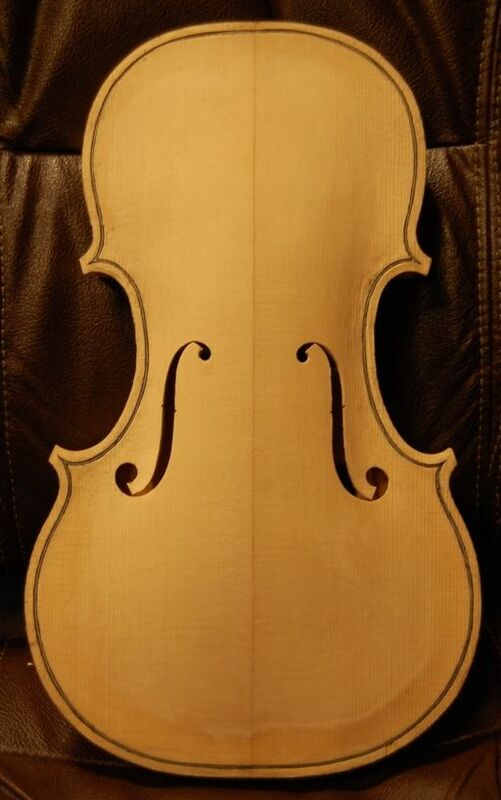 Next, I will check the back-plate fit, complete the back-plate graduations, install the label, remove the mold, clean up the interior, and install the back plate. 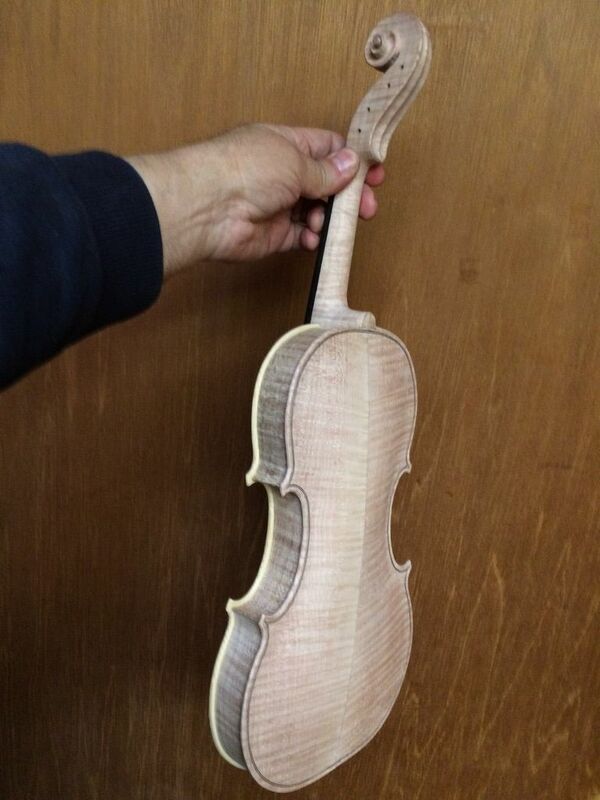 This is the “Titian” Stradivari model. 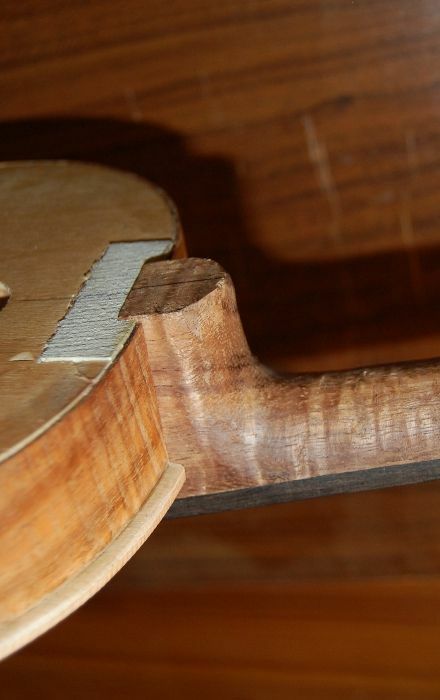 I decided to include a scroll-graft and an ebony “button crown” on the “Plowden” Guarneri del Gesu model. So there will definitely be some additional steps to completion, there. I will try to remember to take more pictures. 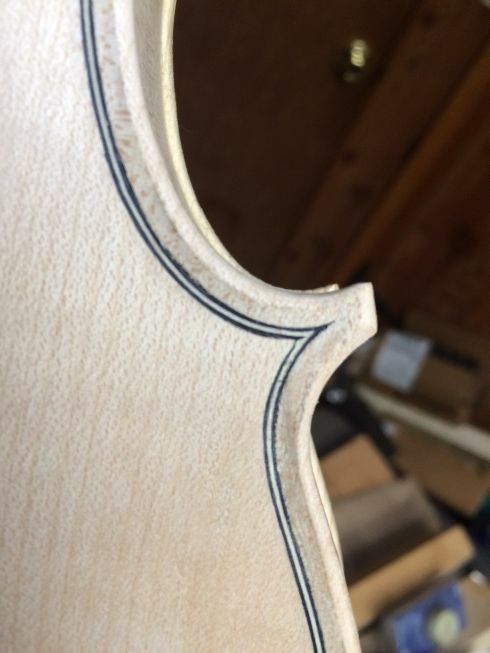 I had a number of other projects going, so I neglected to maintain the website presence…the only post lately has been of another violin resurrection. But…I hope to change that. 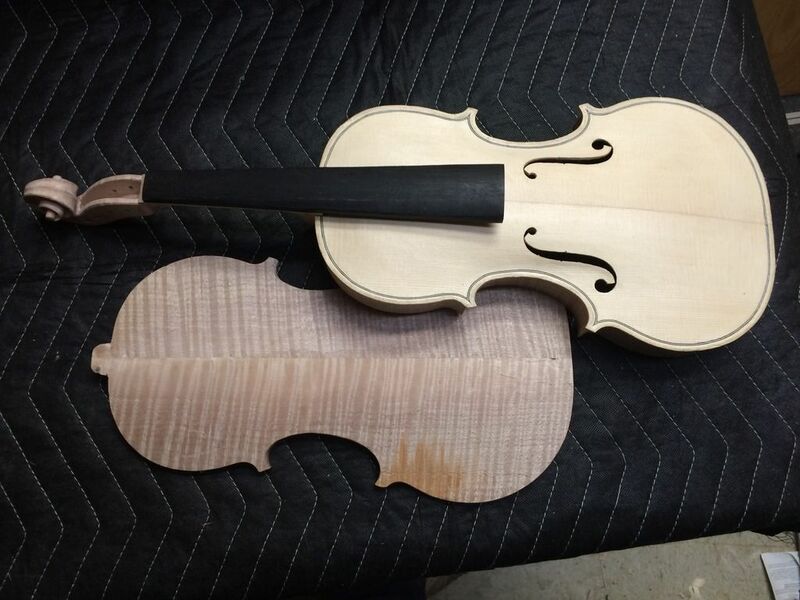 The last post was of the neck-set on the 3/4 violin. 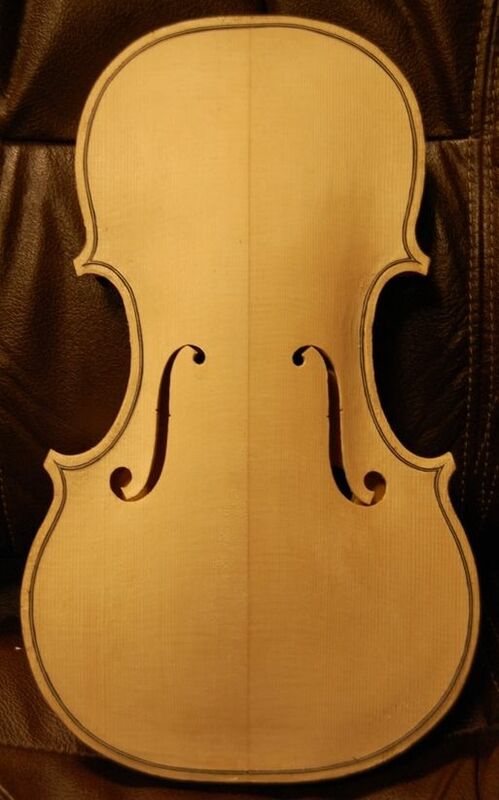 It looked like this– but the back plate was not made, yet. 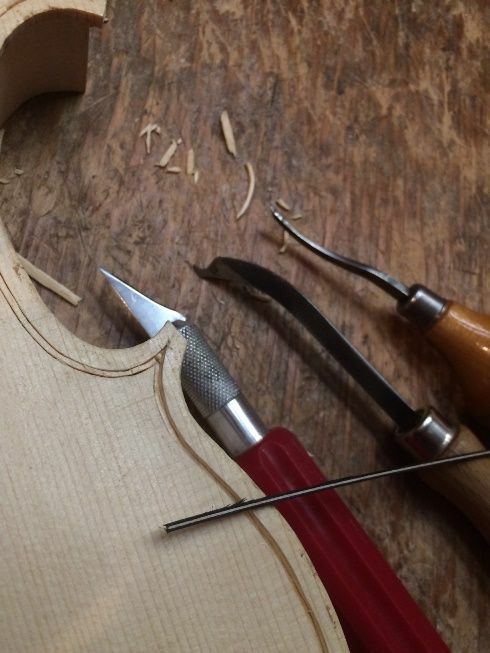 Most makers complete the entire corpus, then set the neck. 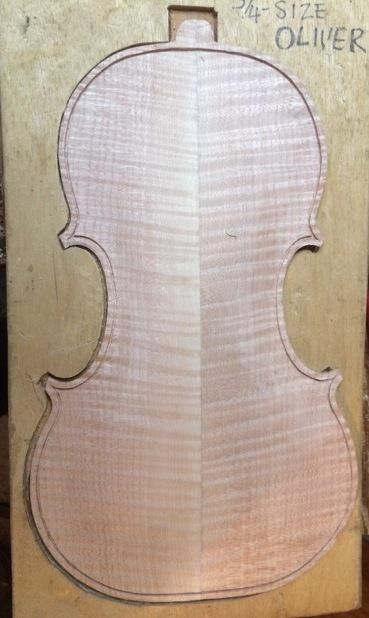 I complete the rib garland and the front plate, then set the neck while the inside mold is still in place. 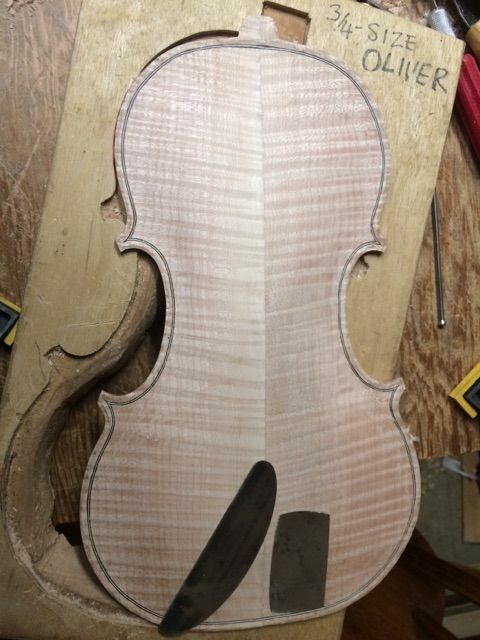 This allows me to get the neck-set perfect, and to level the back of the garland, including the back of the neck-heel, before making the plate. 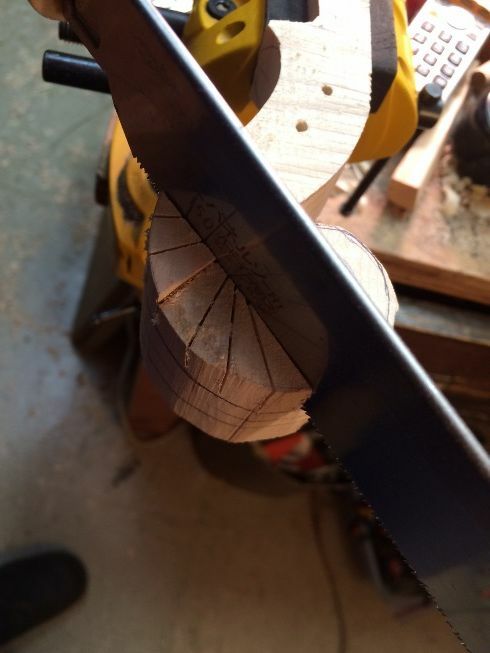 When I install the plate, it fits perfectly, only requiring the final trimming of the heel and button together, to establish the optimum height in the center of the curve of the heel. 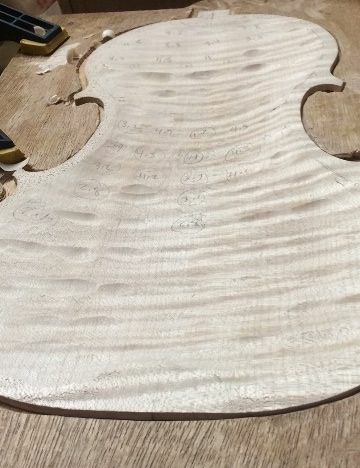 Beginning to carve the back archings. There is a long way to go! 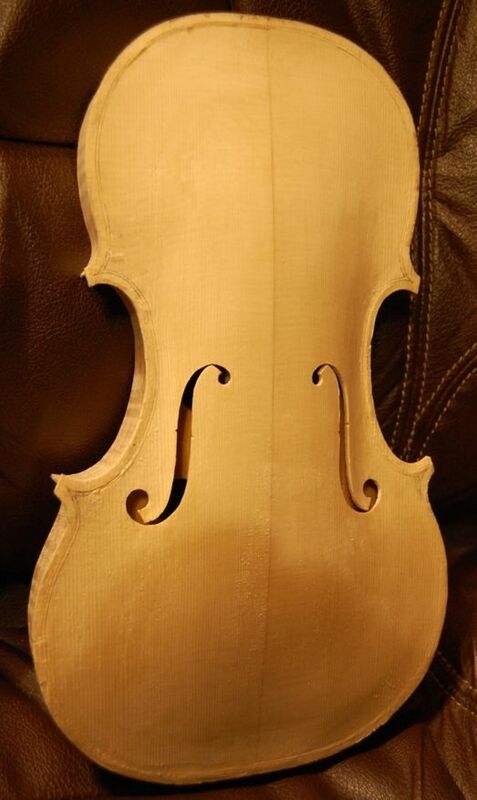 Then I install the purfling, dry, to make sure everything fits correctly. That strip of aluminum is my bending strap. 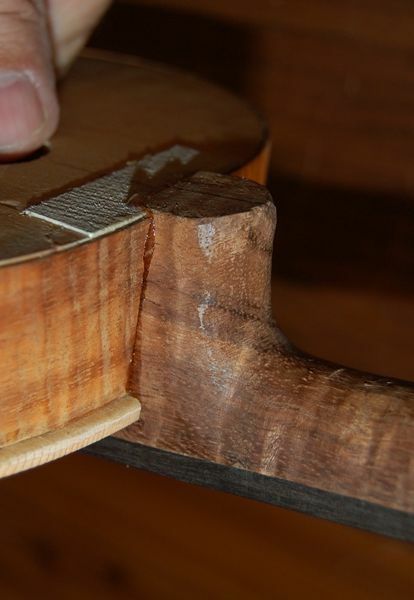 Then I glue the purfling in place. 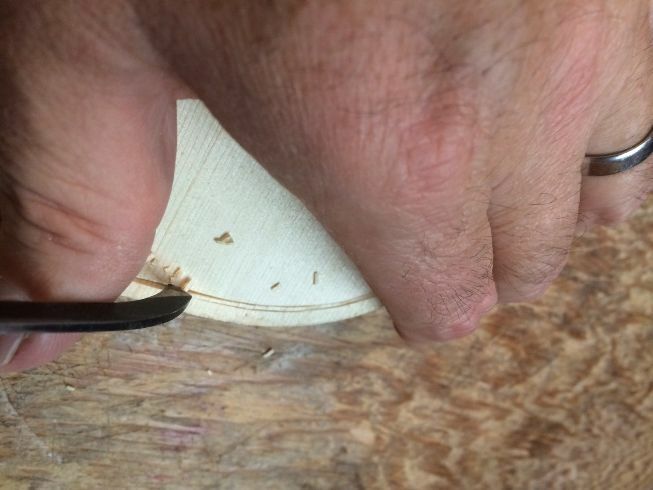 Then I mark the edge of the crest, so I know where to carve the channel. 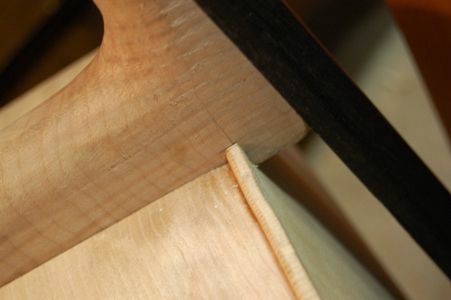 Then I carve the channel, using a gouge, and use planes and scrapers to fair-in the curves of the channel and the archings. 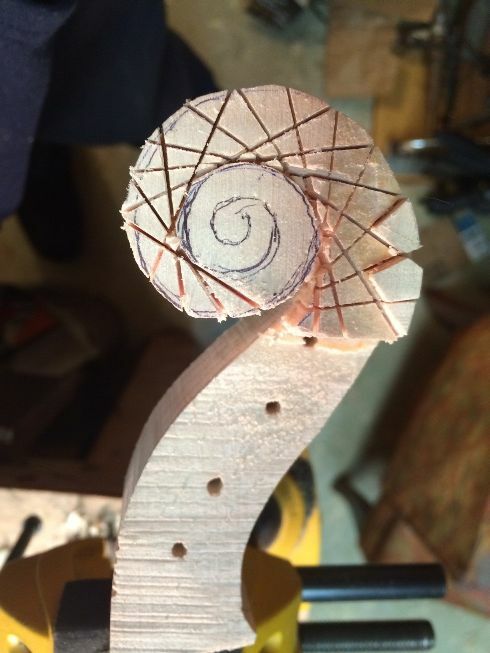 Here, the arching and purfling are complete…but the graduations (inside arching) are not begun. 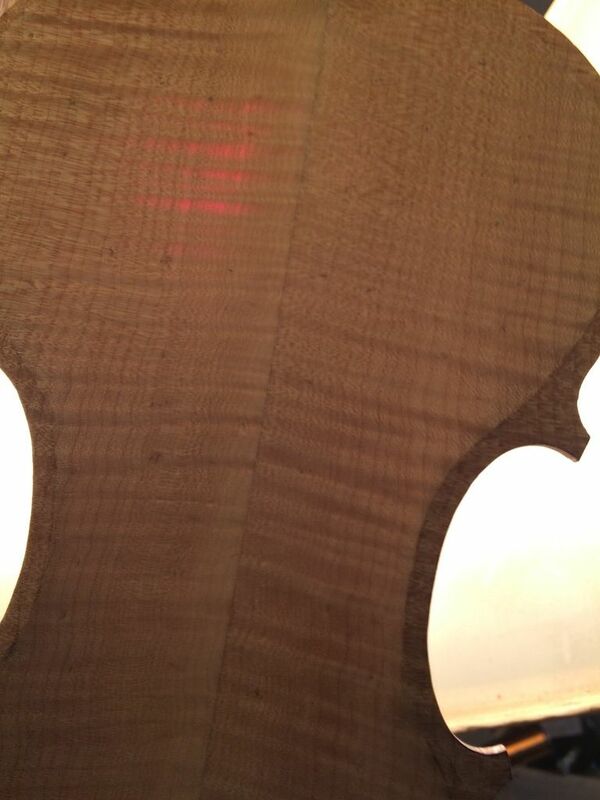 That is a lot of light coming through that spruce plate…it is about the thinnest plate I have made. Even the maple lets a little light through. Finally, to install the label and close the corpus. (I always forget to take a picture of the label…sorry.) 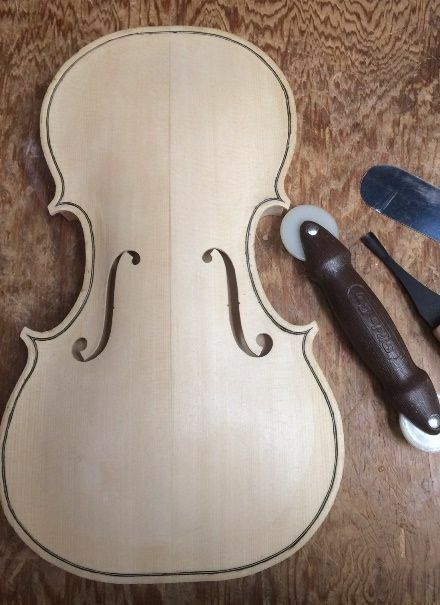 Most makers put their label in after everything is fully completed. 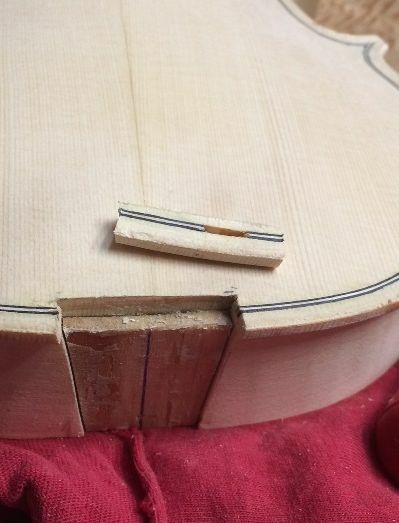 I used to do that, but I found it so frustrating to get a glue-coated label through the f-hole, line it up correctly and get it smoothed out on the back plate…all working through the f-hole…that I decided my labels will go in when I close the corpus; always. That means the label predates the completion by a few weeks at most, as a rule. I think one time there was a long wait, but that was the lone exception. 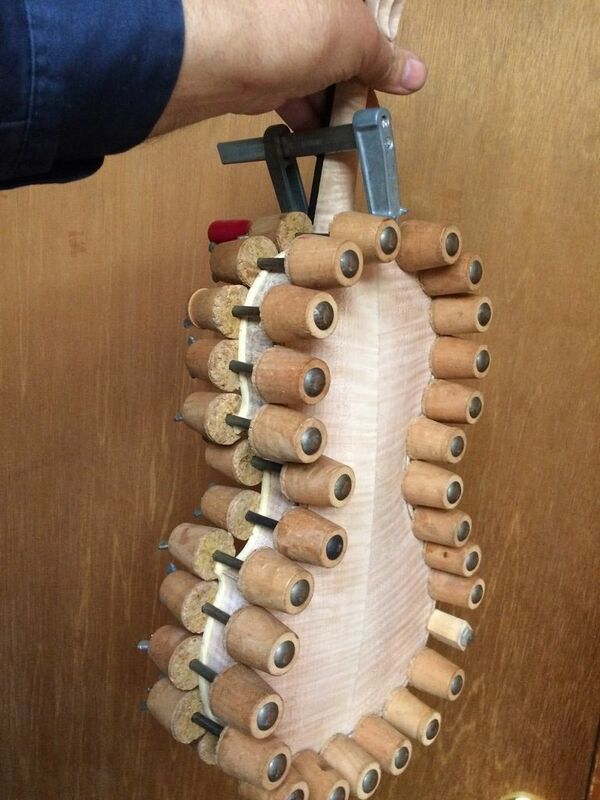 Fully glued and clamped, using hot hide glue and spool-clamps. Closed corpus from the back. Closed corpus from the front. 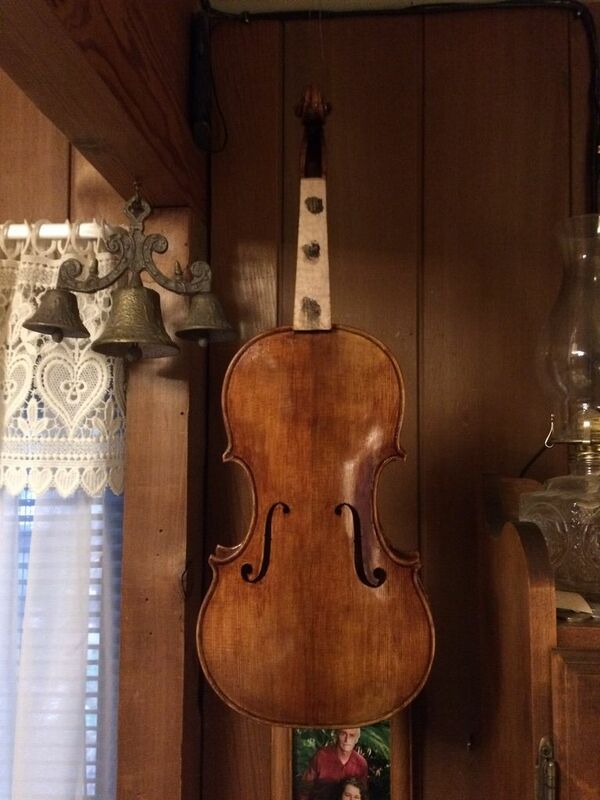 Dainty little thing, isn’t it? 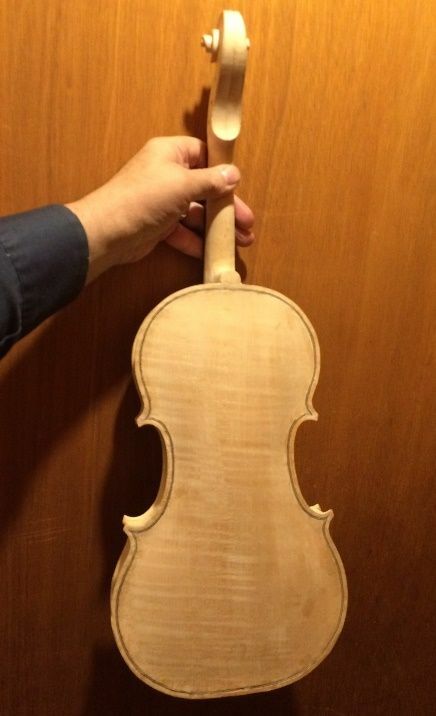 This is my first 3/4-size violin, and it feels pretty tiny. 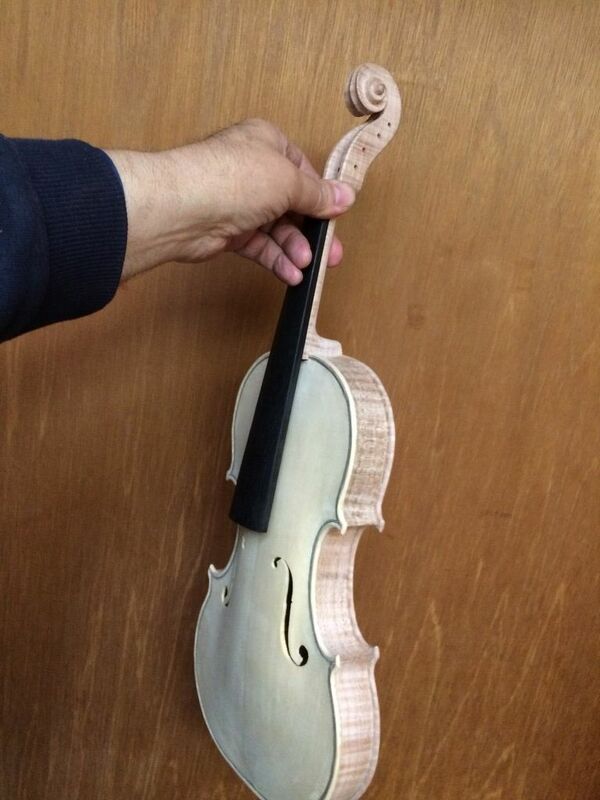 I removed the fingerboard so as to be able to easily access the entire exterior, for final scraping and finishing. After that, I had a lot of “scraping and looking” to do. 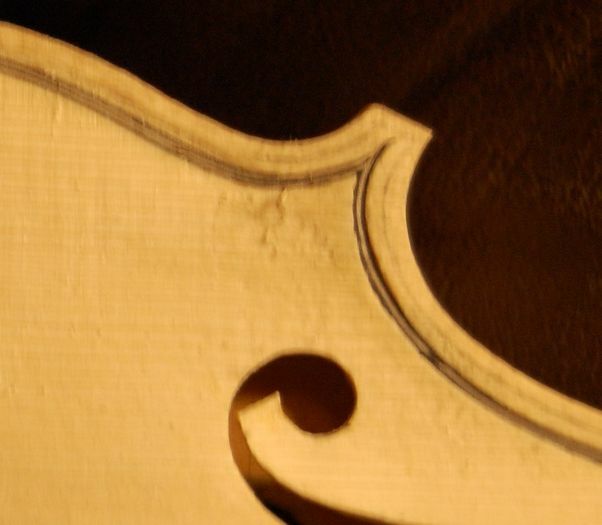 (Scrape and look, using a low-angle, dim light, then scrape and look some more.) 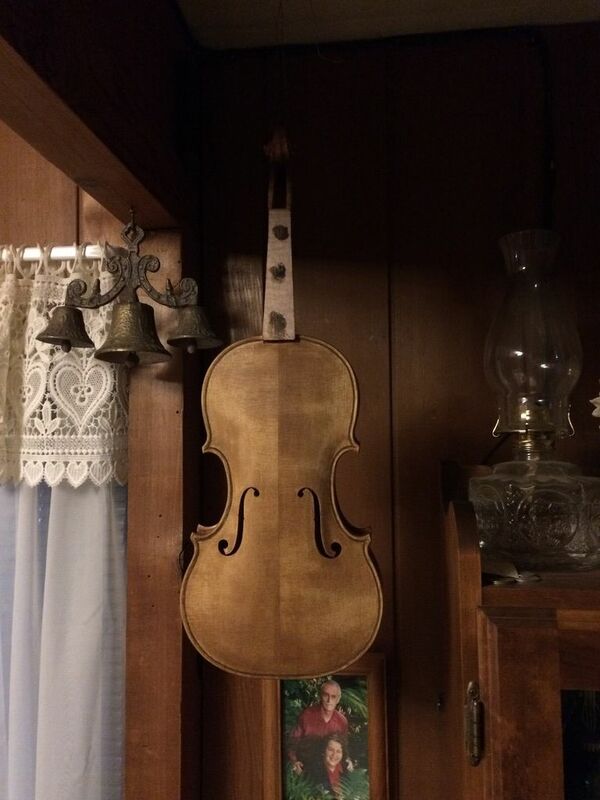 When everything was as smooth as I could make it, and exactly the shape I wanted, I stained the entire violin with coffee, to get rid of the stark-white bare, new-wood look. 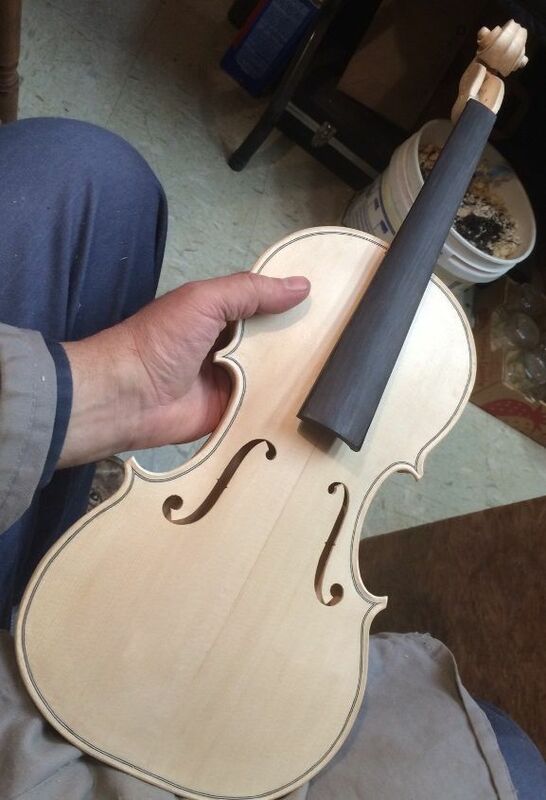 It takes at least three coats, usually, to get the color dark enough that it will not shine through the varnish. The collateral effect is that the grain raises because of the water. 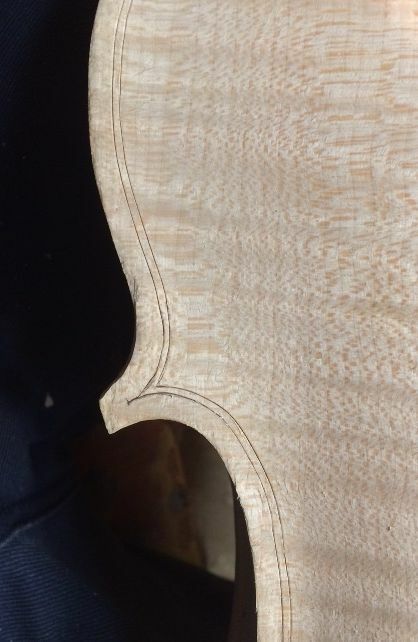 So, I sand it lightly, to smooth the grain “just enough.” I want the grain to be visible in the final state, but not too visible. Then, I rubbed in a coat of the mineral ground. I brush it on liberally, rub it in hard, with my fingers, then wipe it off as hard as I can, using a rag. 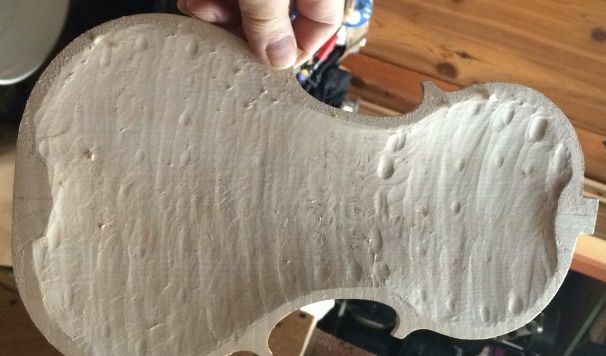 When it dries, the instrument will be whiter than ever– chalk-white, all over. 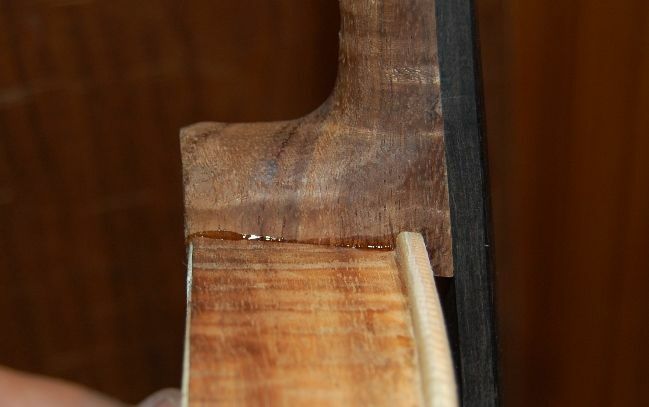 The first time I did this I was pretty alarmed at the look, but I had just watched Roger Hargrave do the same thing, and knew that the white mineral would completely disappear with the first coat of sealer or varnish. And it did! With three coats of coffee, and the dark sealer, the wood looks pretty dark. 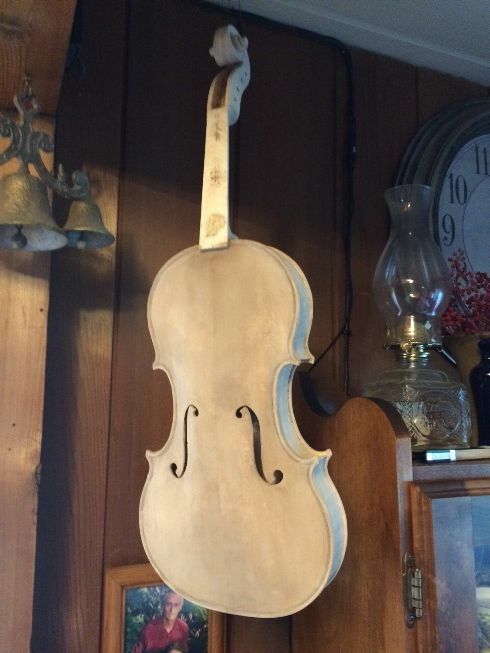 But it will look good under the varnish. 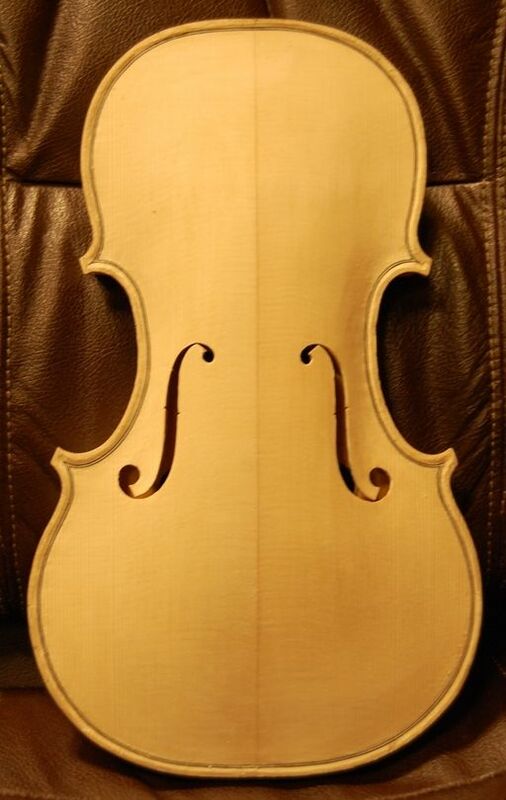 The back, with the seal-coat. 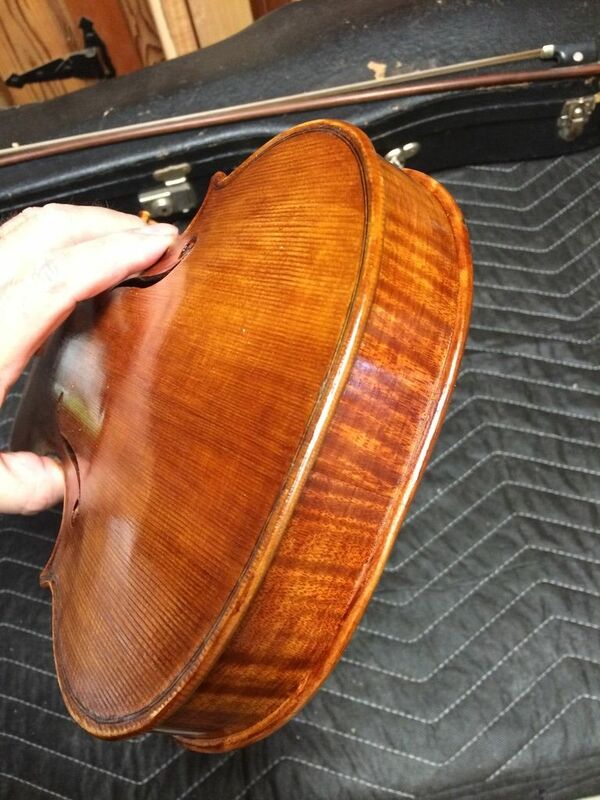 After that it was a case of applying several coats of golden varnish, then a few coats of red-brown varnish, and a final two coats of the golden stuff. 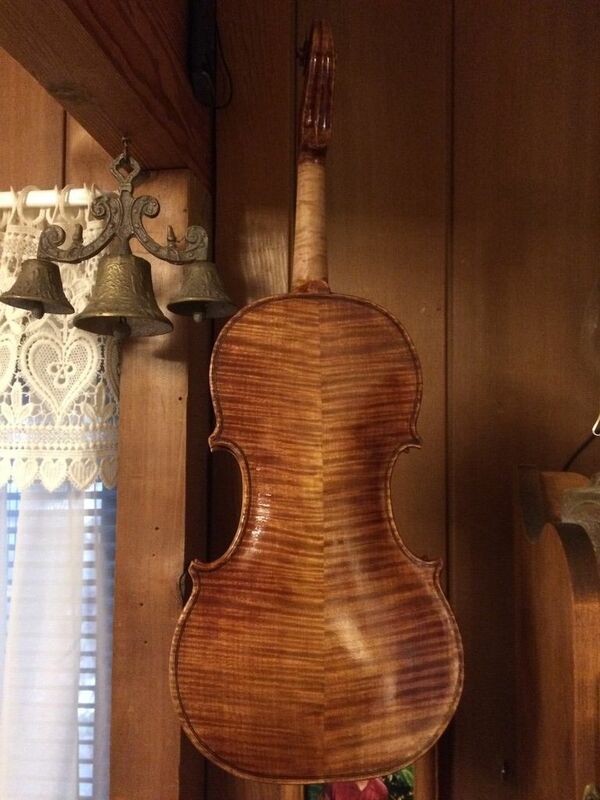 There is the front with the final coat of varnish. 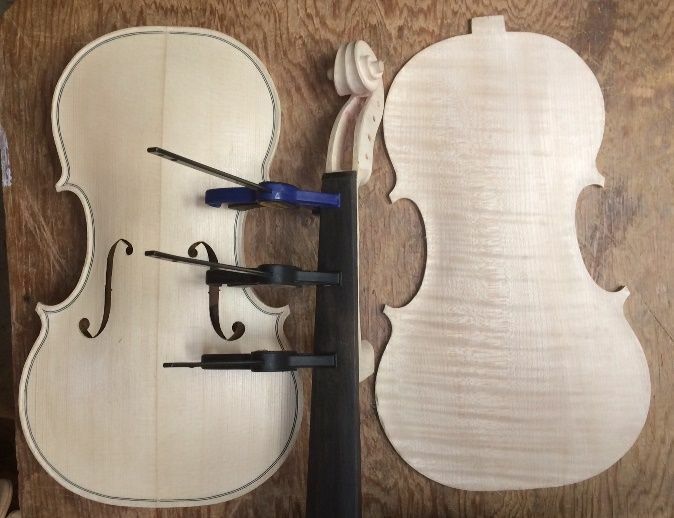 Standard set-up, and the violin will be done! 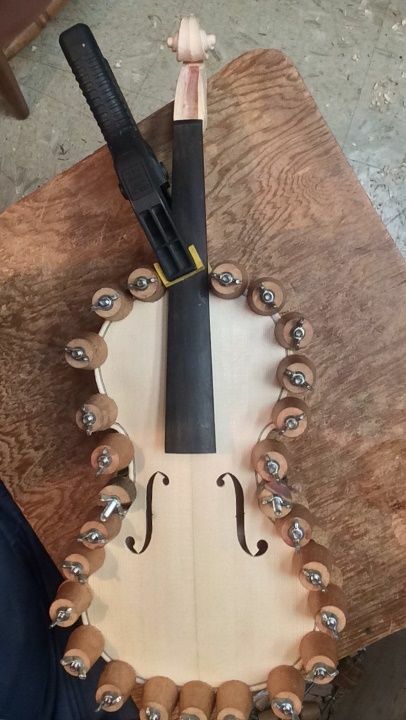 That includes the saddle and endpin, as well as re-installing the fingerboard, fitting and installing pegs, a bridge, the nut, the soundpost, tailpiece, and strings. 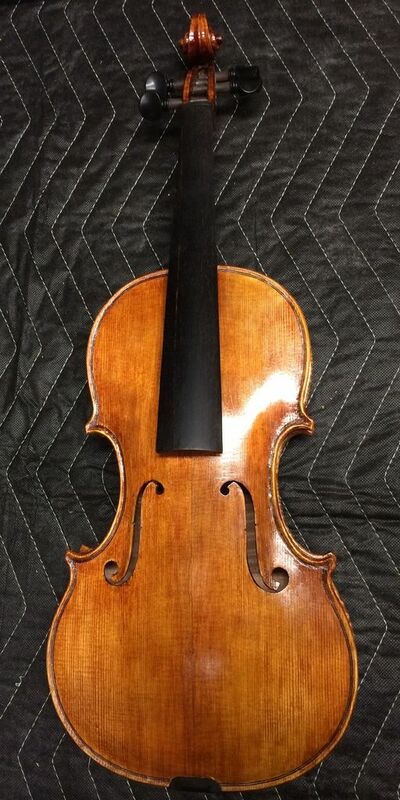 A chinrest completes the instrument. 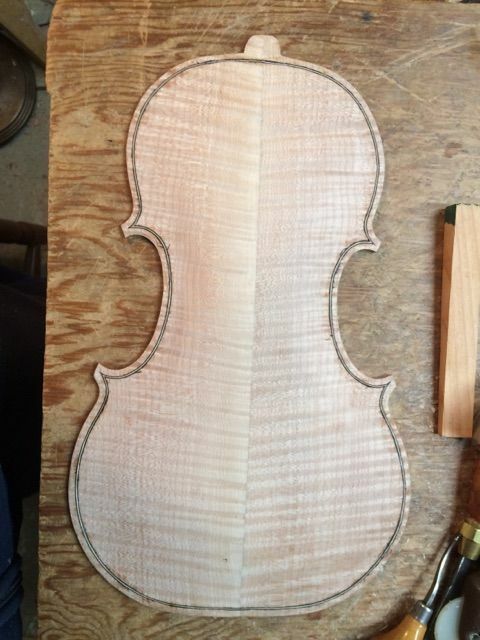 Bottom of the violin before the endpin and saddle were installed. Endpin installed: saddle is next. 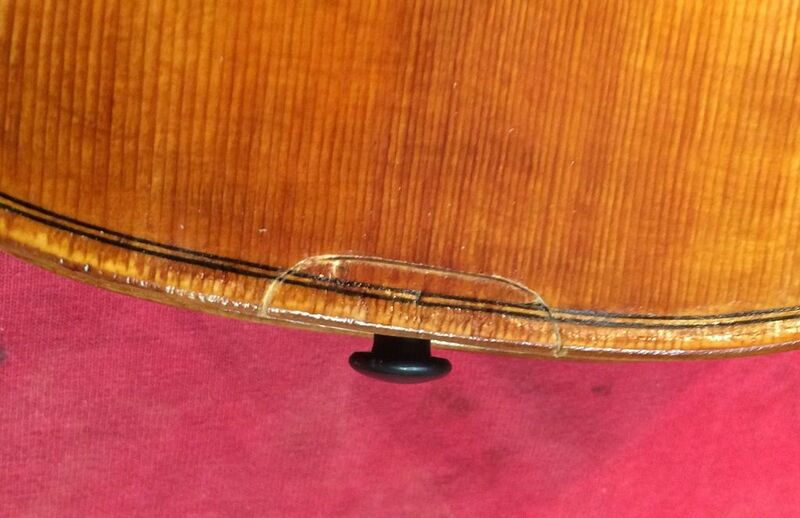 Heres the plan: a rounded saddle to prevent “saddle cracks”. They work because there is no sharp corner to act s a stress riser. 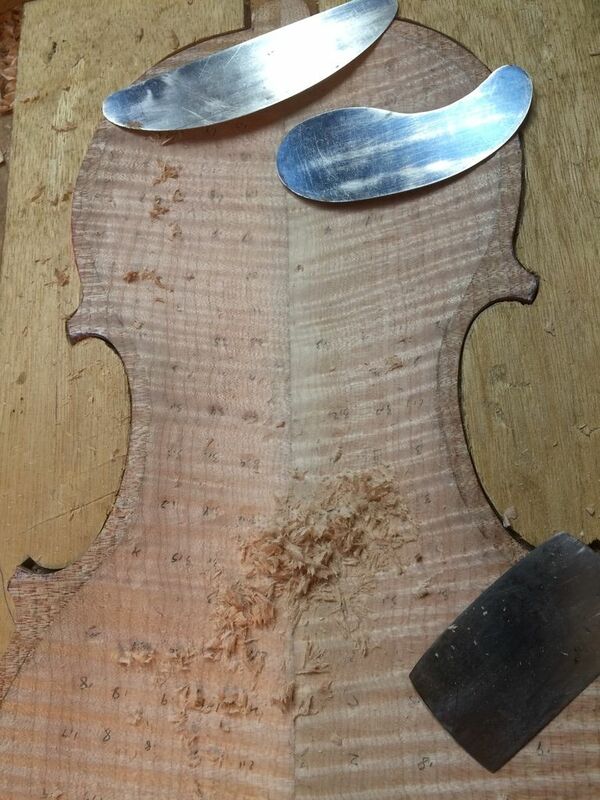 There’s the footprint of the saddle: no further shaping is done until I cut out the mortise in the front plate. 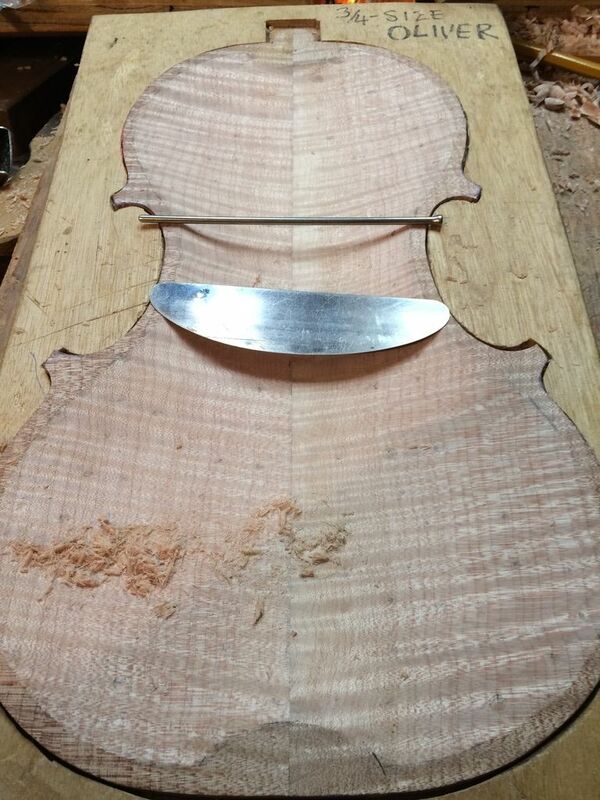 I traced the footprint onto the front plate, and began cutting out the mortise. 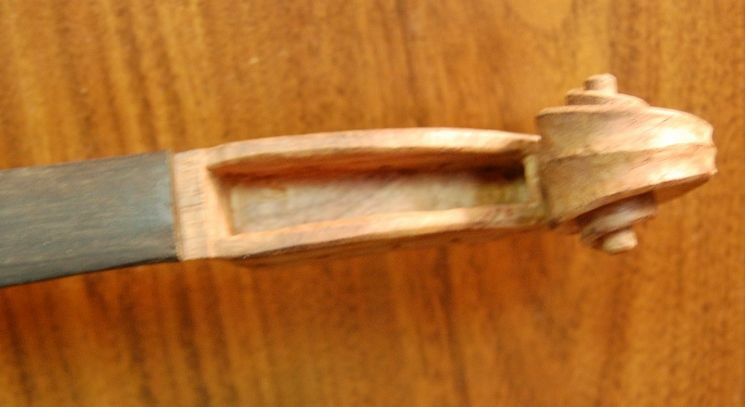 Then I cut out the mortise using sharp gouges and a small knife. Any nicks in the varnish will be retouched later. 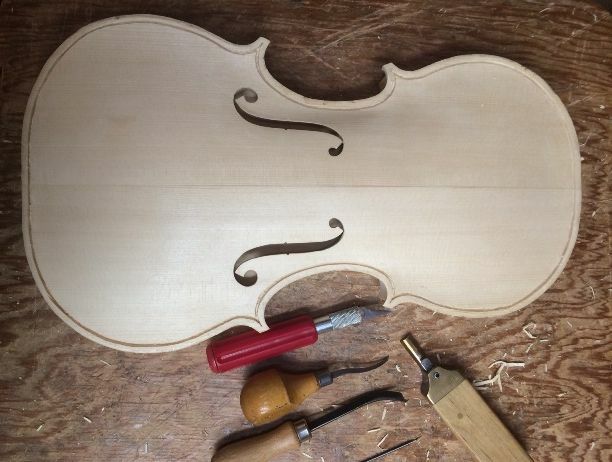 The varying thicknesses of the top plate can then be traced onto the saddle itself, and final shaping can begin. 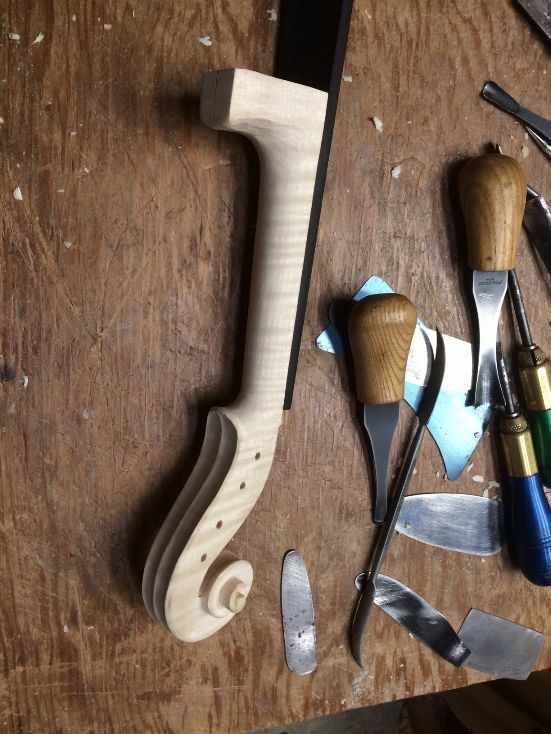 Saddle and endpin are nearly complete. 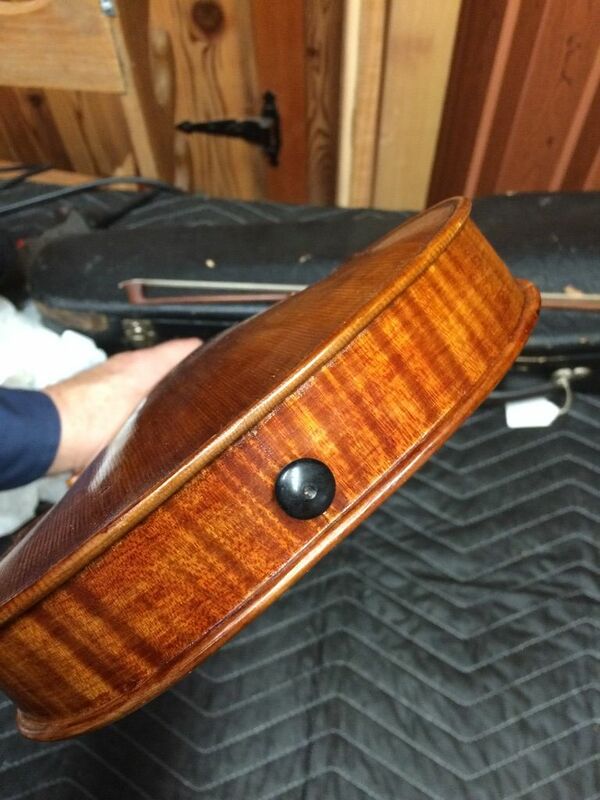 The saddle will be filed a little more, and the varnish retouch will happen later on. 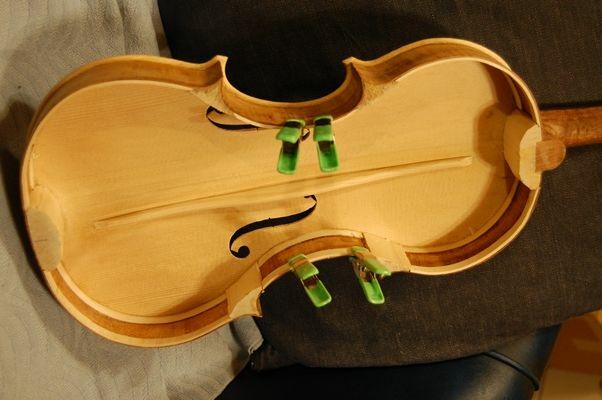 I reinstalled the fingerboard, and while the glue is drying, I fit and installed the tuning pegs. 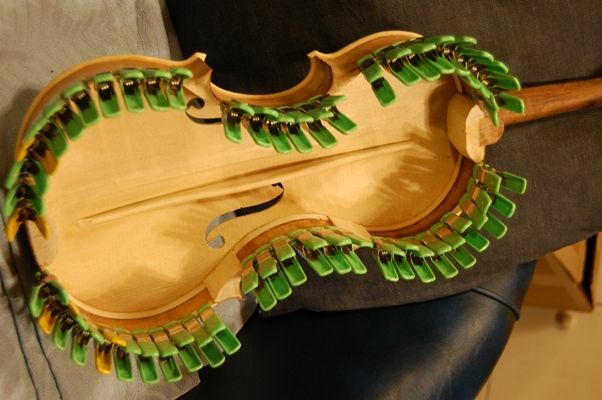 Fingerboard and pegs complete. 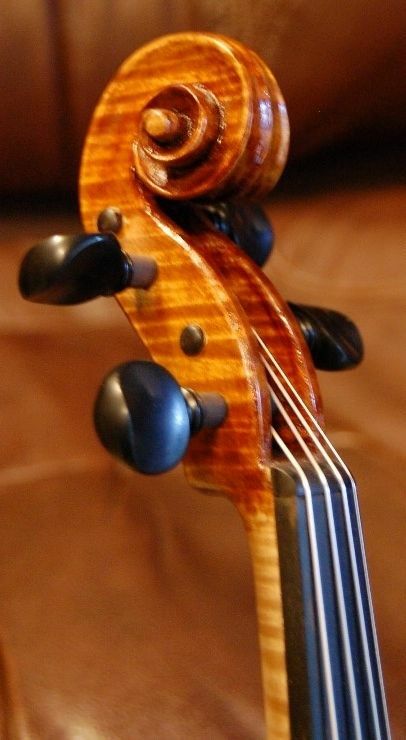 Notice the nut is also intalled. 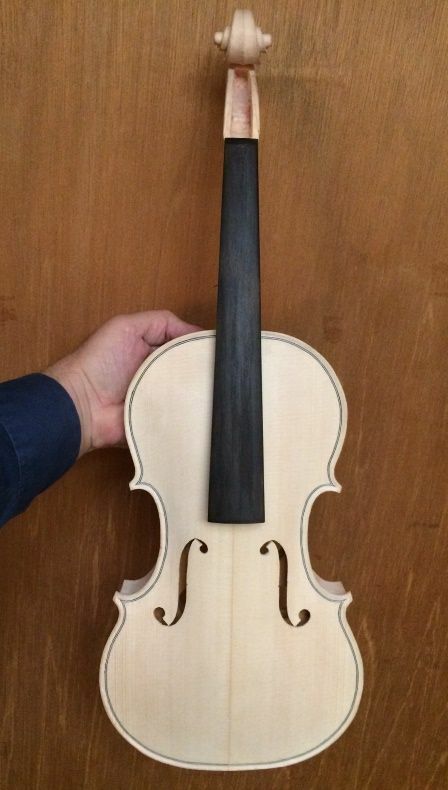 Finally the little violin is complete! Thanks for looking. 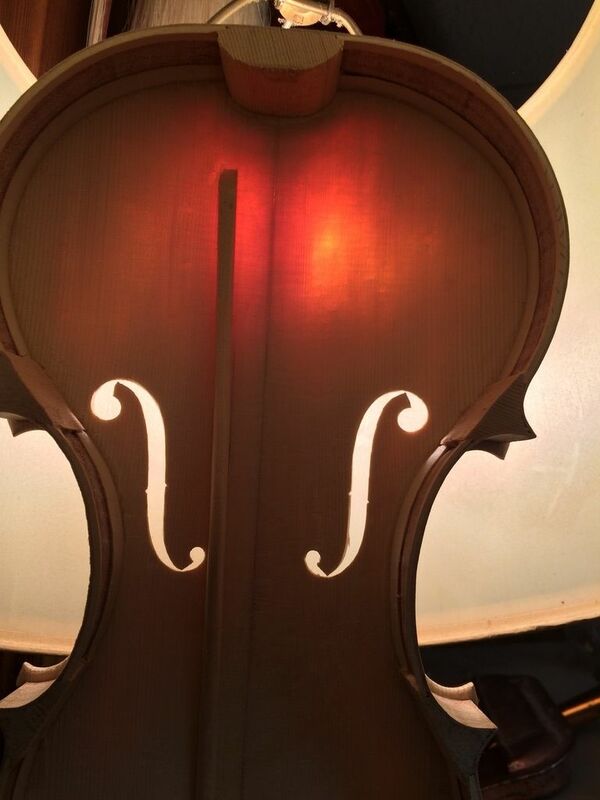 Please keep in mind that the Marylhurst Musical Instrument Show will be April 29th and 3oth. If you can make it, I hope to see you there. 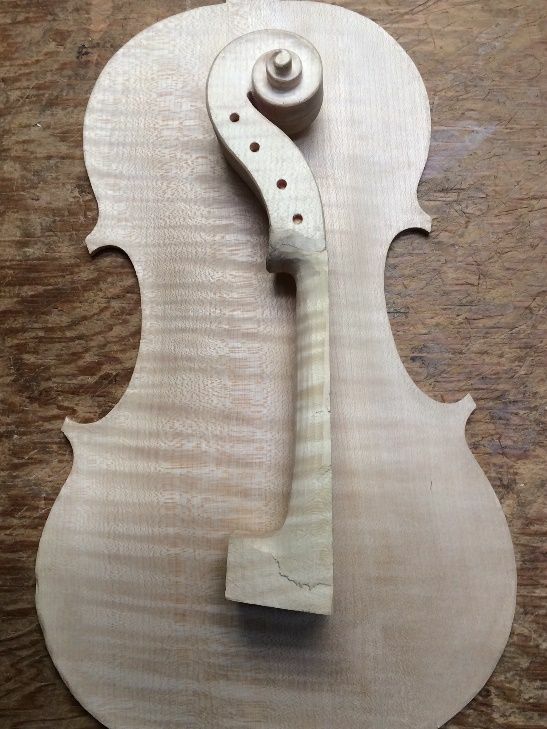 This little violin will be there for you to test drive, along with others. 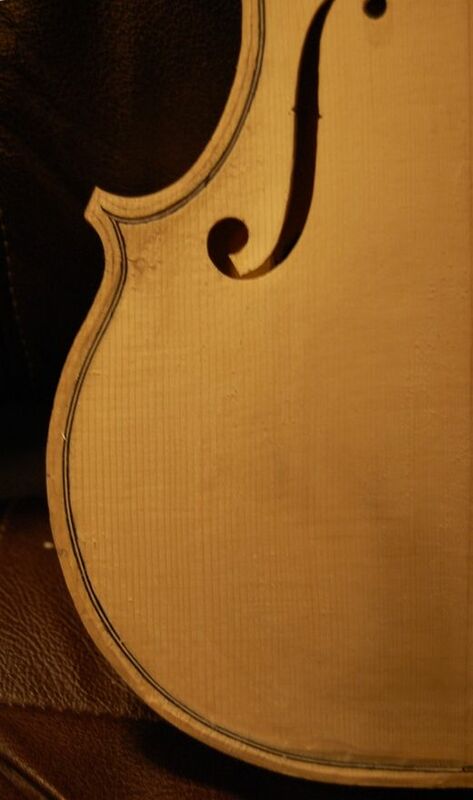 Purfling Slot incised, but not completed. 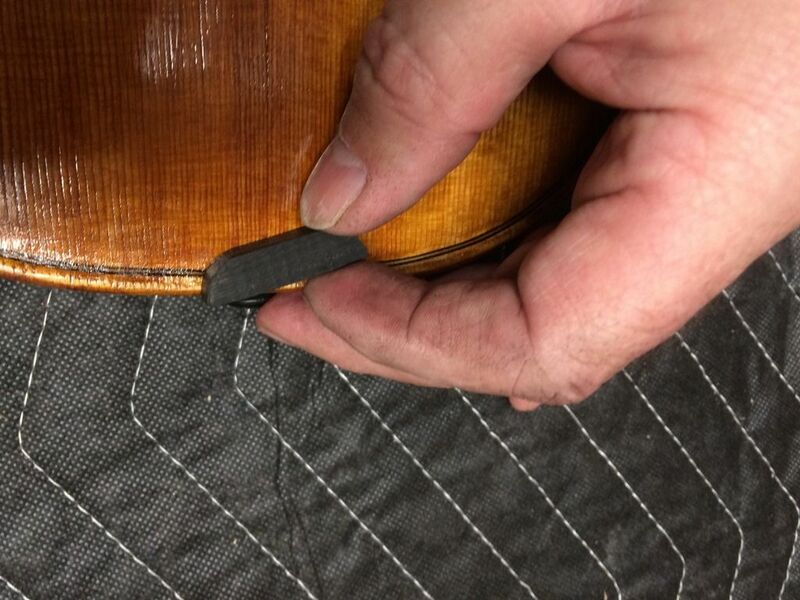 Next I pry up the center of each of the center-bout strips, and, using a thin palette knife, I slip hot hide glue in under the lifted purfling, then, working quickly, I push the purfling back into the slot, and drive it home using a special tool. 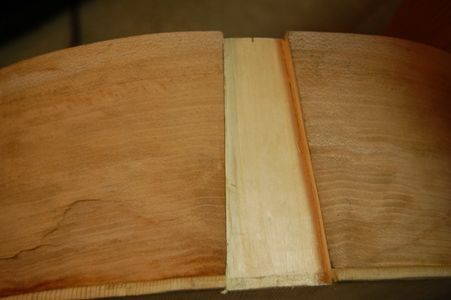 I start at the center ans work toward both ends, so that the glue being forced from under the purfling is driven along toward the ends of the center bout purfling strips, into the mitered corners, so that it glues the ends of the upper and lower purfling strips in place, as well. Edge Crest boundaries inscribed…it’s a blurry photo, but you can see the penciled lines. 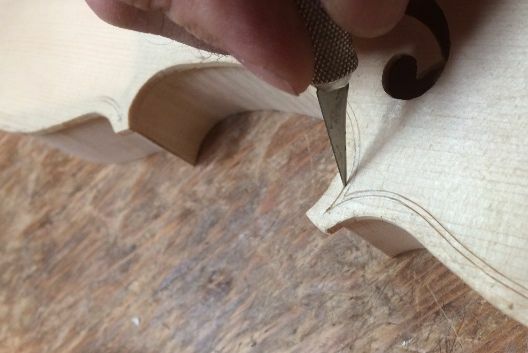 Then I begin cutting the channel: a trough whose outer edge is the line I just inscribed, but which cuts only as deep as is necessary. Beginning of the channel. 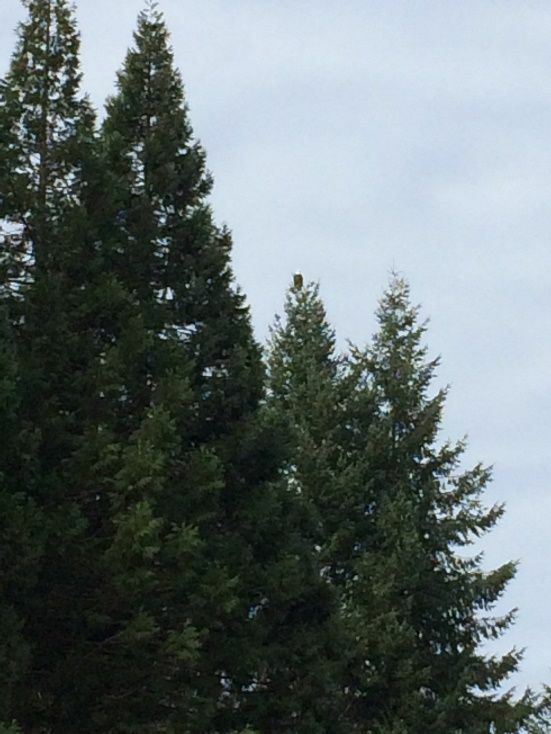 The Edge crest is still visible. I have just begun to cut the channel. 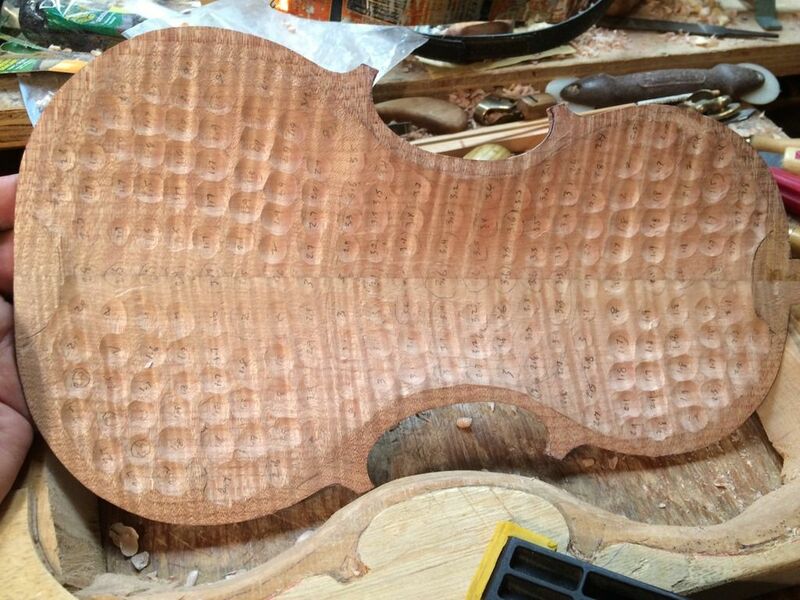 The next step will be to remove the mold and install the back linings to the ribs. 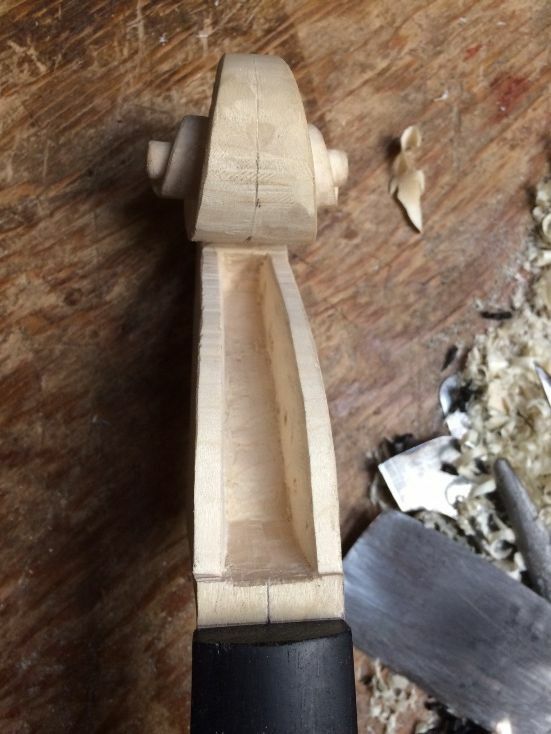 I’m quite sure it is virtually identical to how other makers do it, with one possible exception: I set the neck while the corpus is still on the mold, with only the front plate installed. 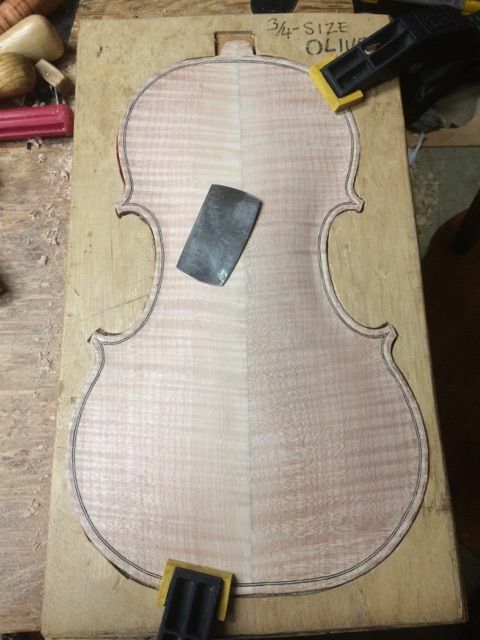 Lay out the mortise outline. 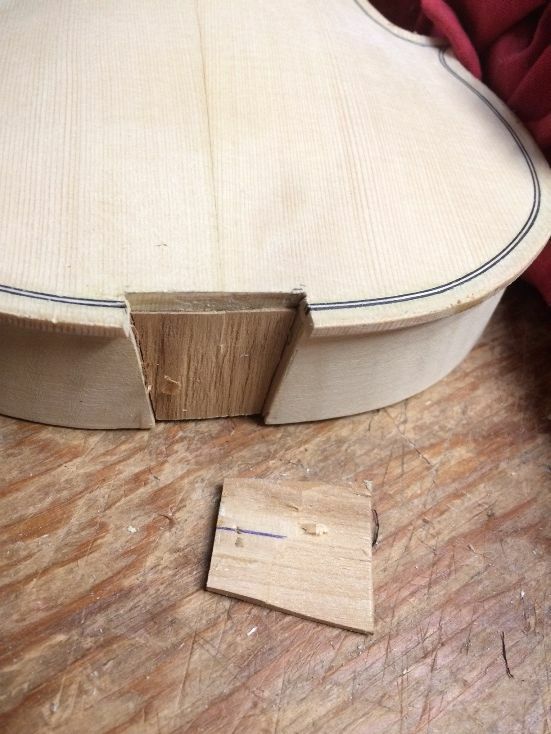 I lay out the center of the neck block, and perform the remaining layout from that centerline. 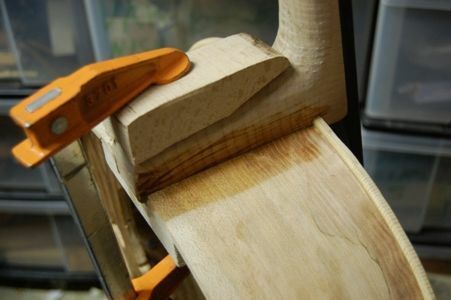 The heel is to be 30mm wide, and the front of the neck where it joins the corpus is 42mm wide. 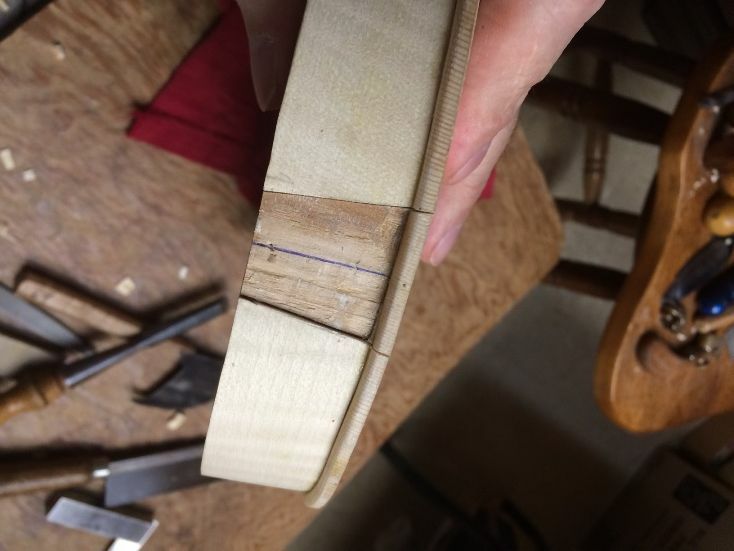 So I mark 15mm to each side of the centerline at the heel, and 21mm to each side at the front plate. Double-check everything. 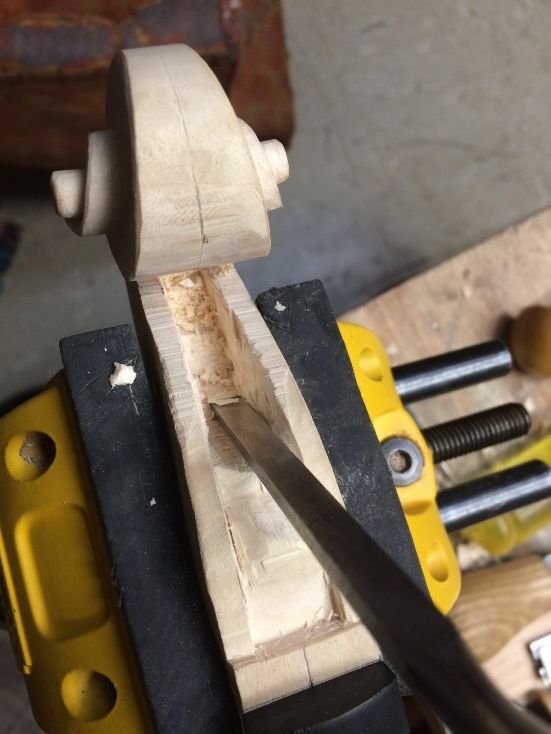 It is a real pain trying to put wood back. 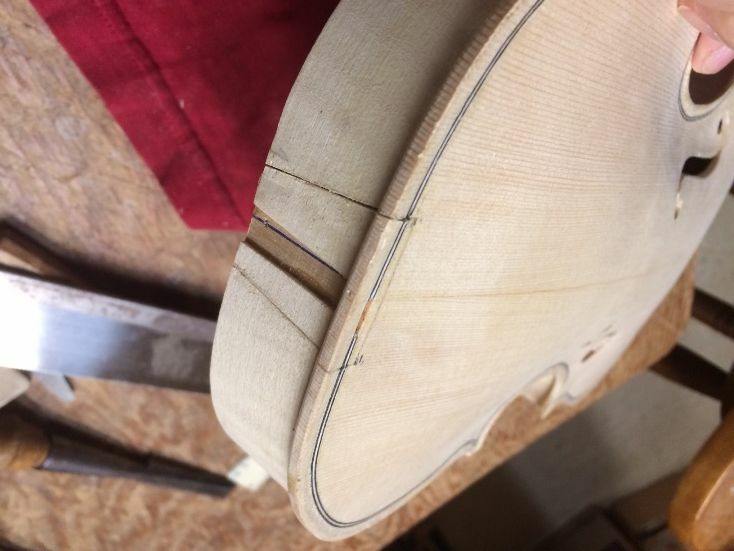 I check my measurements, and mark the location on each side of the neck where the front plat should sit when all is complete– 280mm from the top of the fingerboard, and 20mm down from the top of the neck at the front. I want the neck centered, obviously, but in terms of simple location, I accomplished that by careful layout– I want it centered, in that the fingerboard will be centered on the corpus, and the centerline of the scroll will be in line with the centerline of the front plate, as well. 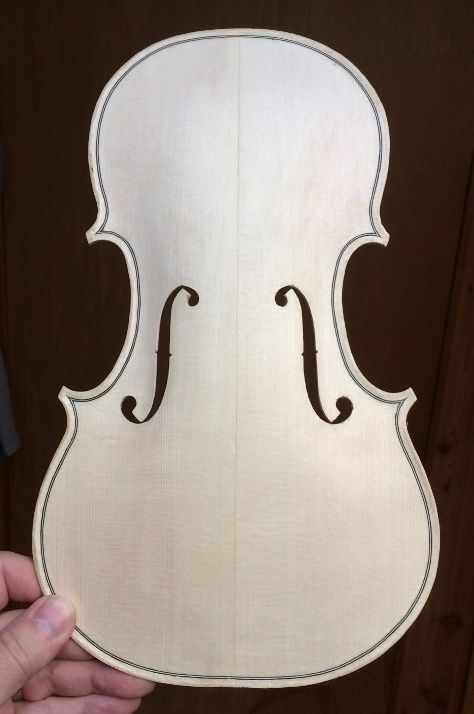 I want the neck straight, in the sense that it is not rolled to one side or the other. I can check this by sighting across the “ears” of the scroll at the edge of the front plate. If they seem parallel, I am satisfied. I want the neck the proper length. 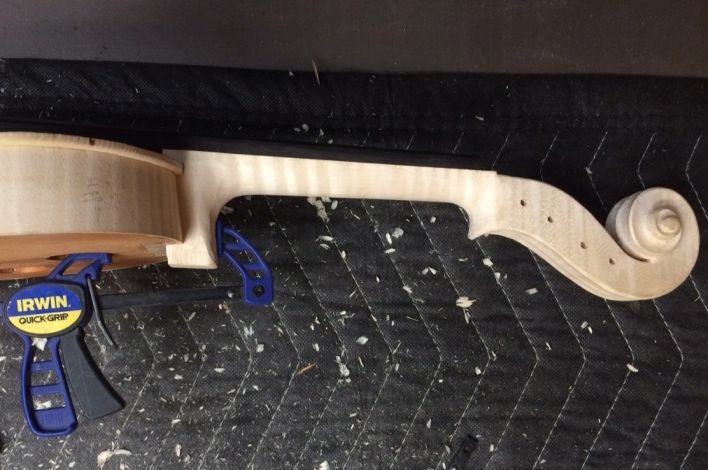 That 280mm mark I put on each side of the neck will let me know when I am getting close. I want the front of the neck the right height off the front plate. 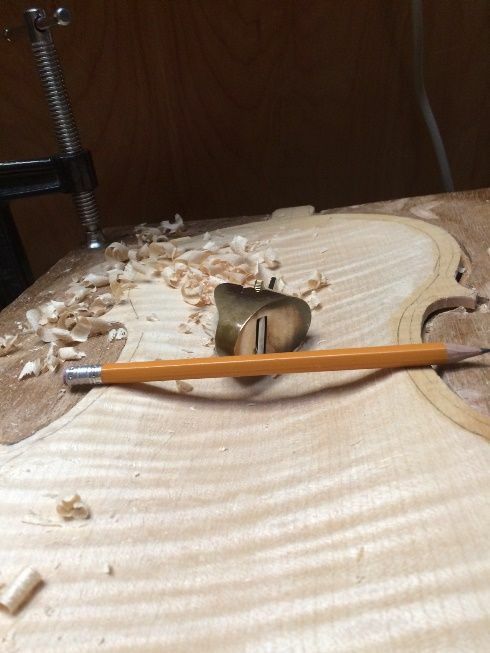 That was the 20mm mark I put on each side of the neck. 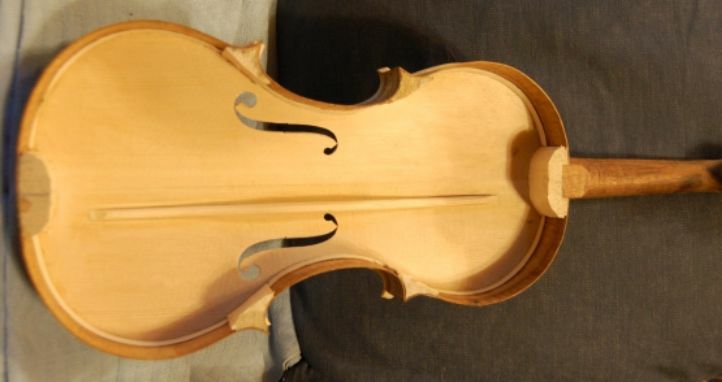 Finally, I want the neck angle to be such that the bridge will be an appropriate height. I aimed for 65mm at the end of the bridge, so as to arrive at an 82mm projection at the bridge– the bridge, then would be roughly 90mm tall at center. There is some flexibility on this one, but not a great deal. 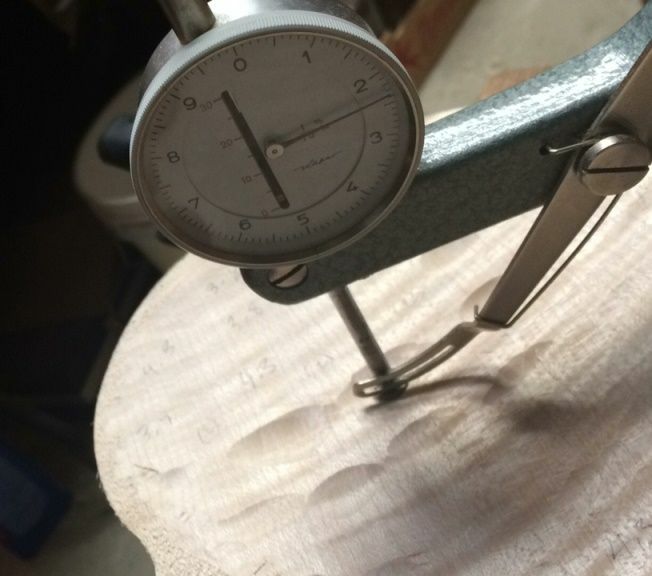 In reality, all five of these measurements simply have to be within tolerance, or the instrument will not work right. 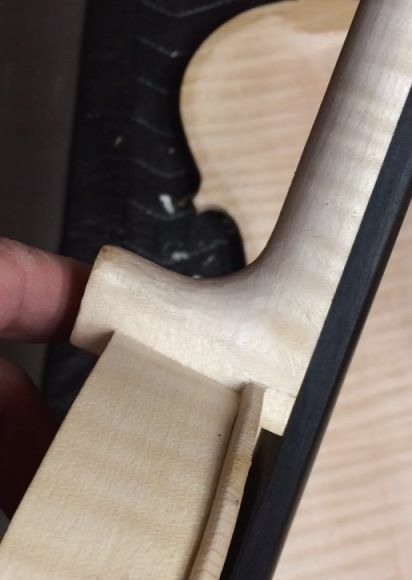 So, with all of that in mind, I measure from the 280mm mark to the end of the neck, to see aproximately how deep the neck mortise must be at the front, then use a Japanese pull-saw to slice along my layout lines to nearly that depth. I stay inside all my layout lines, as I want to leave a little room for adjustment. 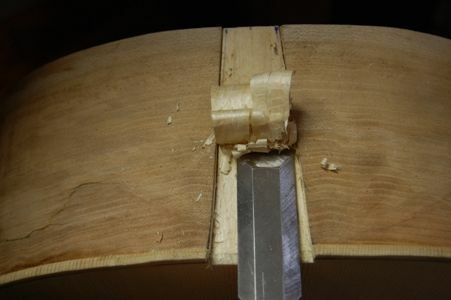 I begin by removing the section of front plate affected by the neck mortise, then use a chisel to remove the waste wood from the mortise itself. 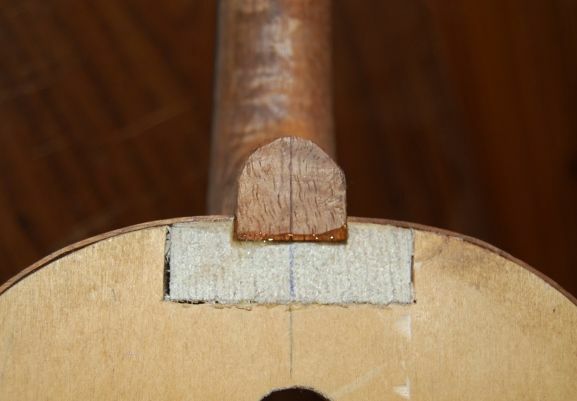 I try to get the mortise nearly right on the first try, but deliberately leave some room for adjustment. 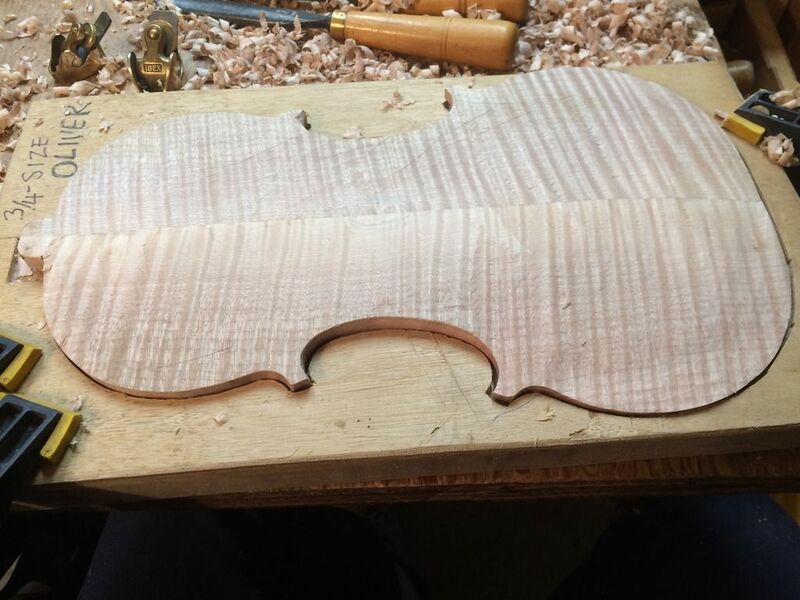 You can tell from the location of my layout marks that I still am far from done– but the neck fits fairly well, and I will be removing paper-thin shavings from here on, and checking every step of the way. Now you can see that the layout lines are very close to what I wanted. In fact, I had deliberately marked my height at 21 mm, to give room for adjustment… and it is at 20 mm now, which is fine. The 280 mm mark is dead on target. 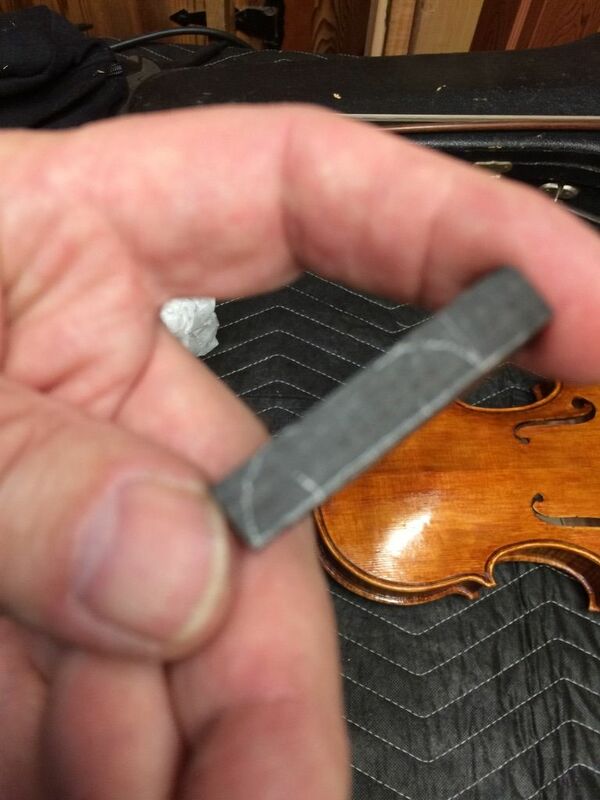 Notice that the heel is overhanging the back of the block by nearly 5 mm. 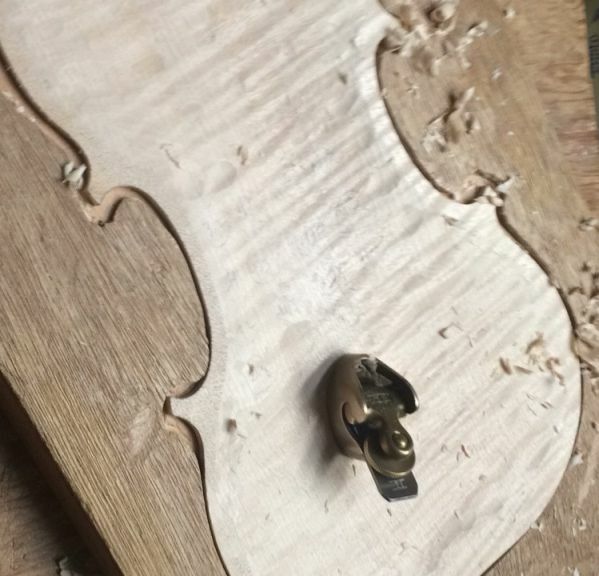 That is fine– I will remove that excess wood when I flatten the back of the garland, and the back plate will be the last major component installed. 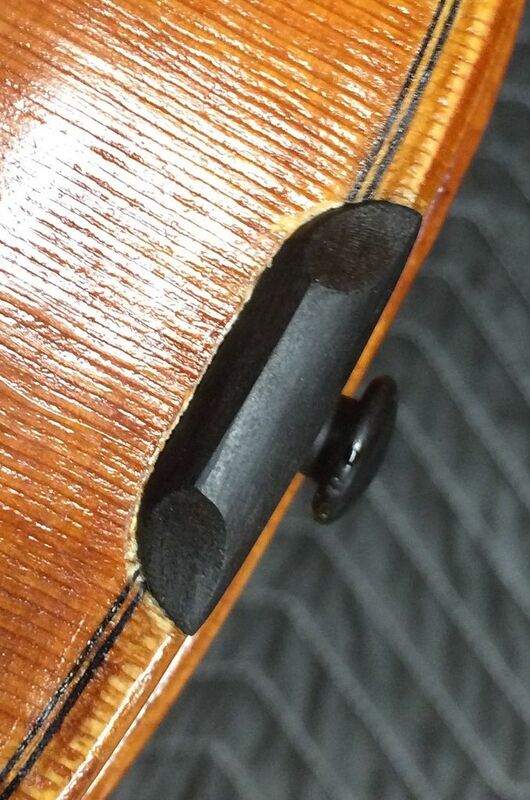 Here is a closer look– the length from the top of the fingerboard to the edge of the front plate is pretty critical. 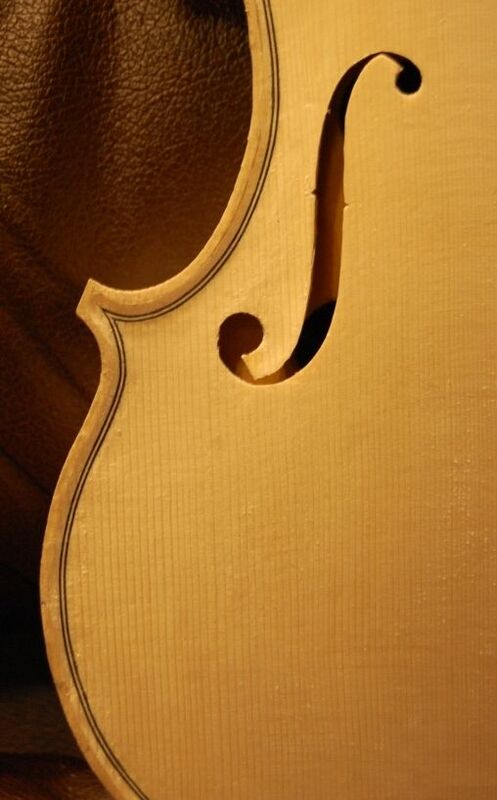 a good player will notice any variation. the overstand (height above the front plate) is less critical. 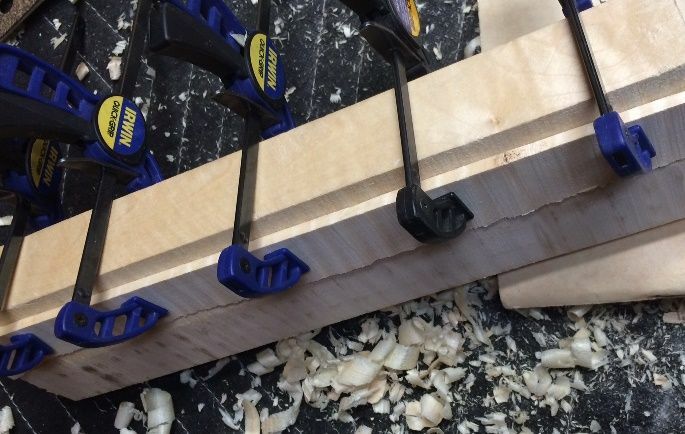 I checked and double- and triple-checked until everything was perfect, then slathered the hot hide-glue into the mortise and onto the neck, then rammed the neck home and clamped it tightly. 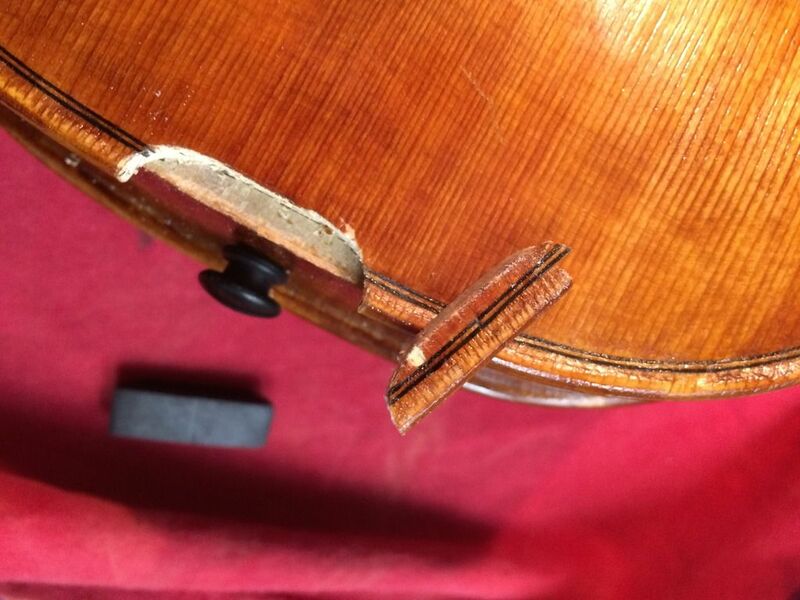 I checked once more with the clamps in place, to see that the measurements were still OK. (Thankfully, they were!) Cleaned up with hot water and a brush. 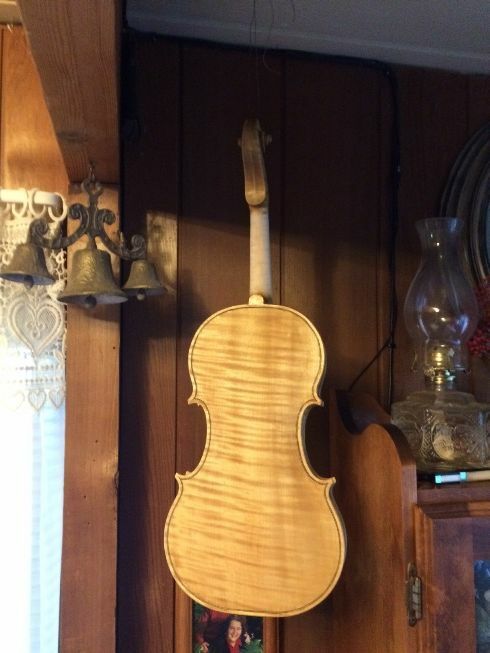 Now it just has to dry. 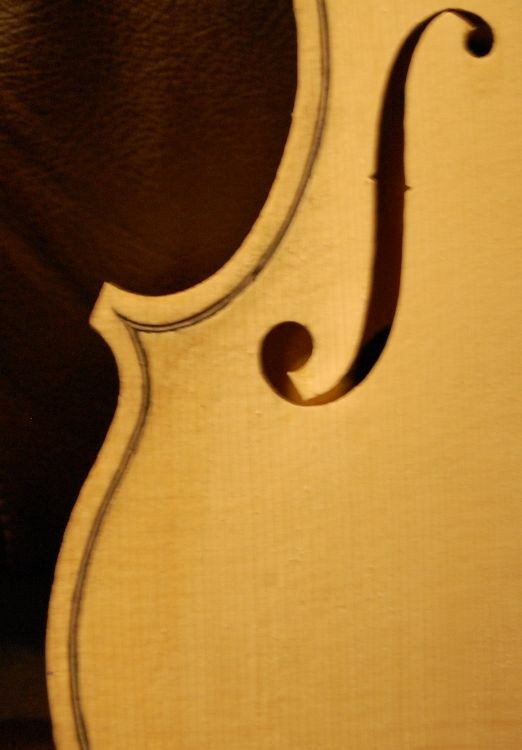 That clamping block in the photo above was just a scrap of wood– I cut it to the correct angle, then hollowed out a curved opening to fit the cello neck-heel. 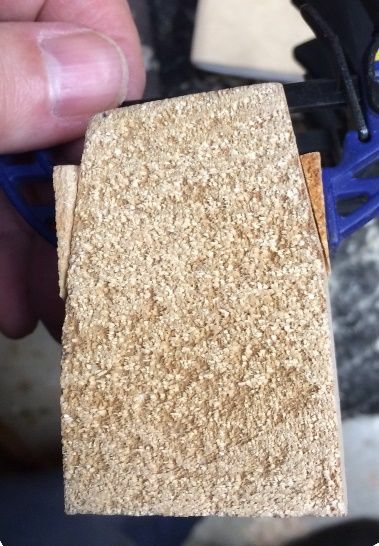 I glued a pad of 1/8″ cork into the cup, and it works very well. And that is pretty much all I got done today. Cooked a roast… fed the cat, brought in the newspaper…that’s about it. Pretty tired.